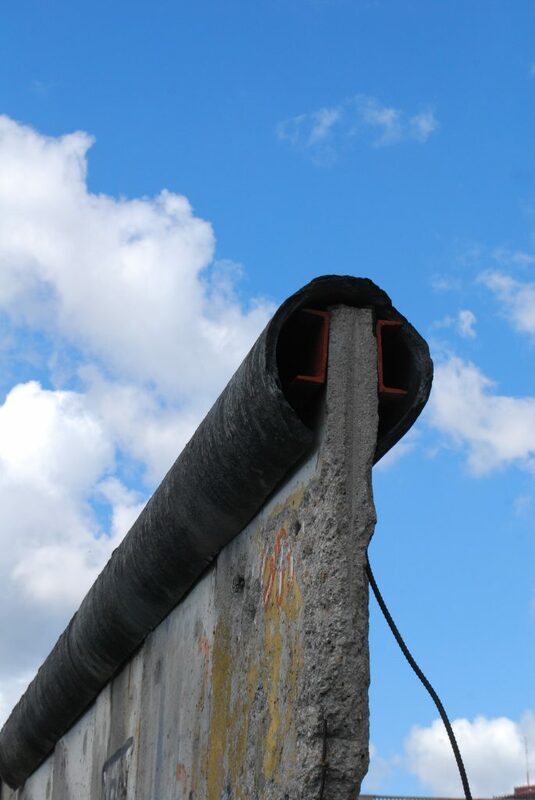 Corny title I know but I’ve read so much about Berlin and it’s history in the last few weeks that Kennedy’s “We have never had to put a wall up to keep our people in” speech needs a reference. 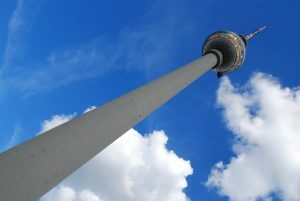 Berlin is a big capital city, it’s got lots of the bits that other big cities have, but what it has on top is a crazy crazy history of change that in the last 100 and a bit years has been just nuts. This Berlin wears on it’s sleeve (not necessarily by choice) with it’s architecture (not so much old, lots of new, western vs eastern), it’s parks (Templehofer Feld, and some of the huge rubble mounds from post war re-construction), but maybe most is monuments and museums. I get the idea that to be a Berliner means to never forget the recent history of division and war. – History wherever you look. There’s the obvious, but then the less. We walked out of our camping place into Humboldthain park opposite and there was a hill we walked up for the view. Turns out it was one of many huge mounds created from cleared rubble after the war. 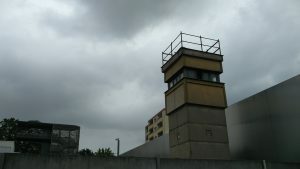 I was walking through from checkpoint charlie to the holocaust memorial and stumbled on Hitler’s bunker. It’s just everywhere and not just in the centre. – An evening ride out into town on my bike. I rode down through Hackescher Markt to Alexanderstraße and Karl-Marx-Allee and being stuck by the sudden change to the monumental DDR architecture. 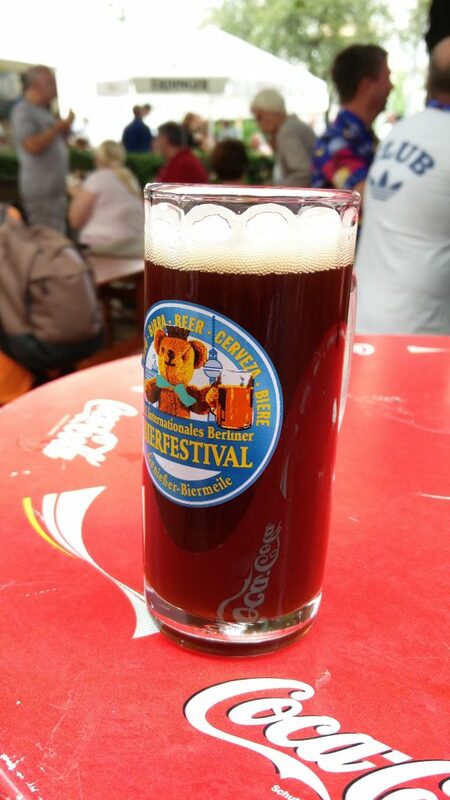 I stopped at a cool outdoor shop called CAMP4 to get Jayne a pannier and me a new shell, then rolled a bit further to the Berlin beer festival which was a bit overwhelming….until I’d had a few beers! 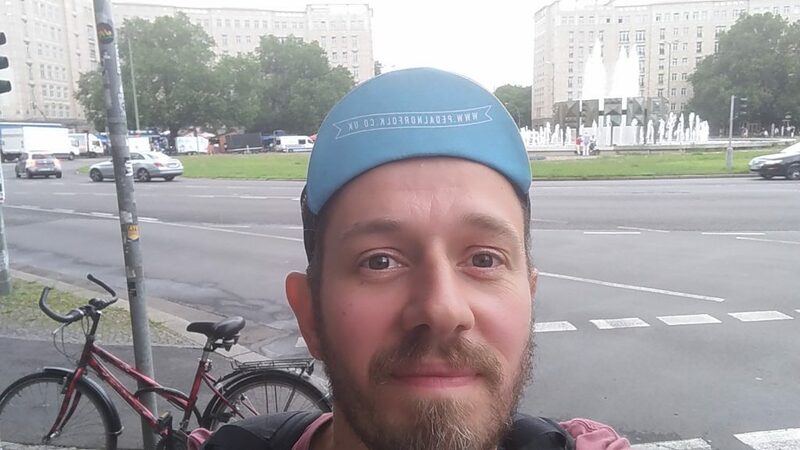 My ugly mug at the top of Karl-Marx-Allee about to do battle with the beer festival! – The English bookshop. Sad I know but I’d run out of english books and would rather read paper than tablet if I can. I bought one on Berlin, the Stasi, German history……(and a random booker nominee). I’m justifying the expense on them being souvenirs that are educational!!! – All of us meeting up and getting lovely street food at a random celebration of something or other near Alexander Platz. 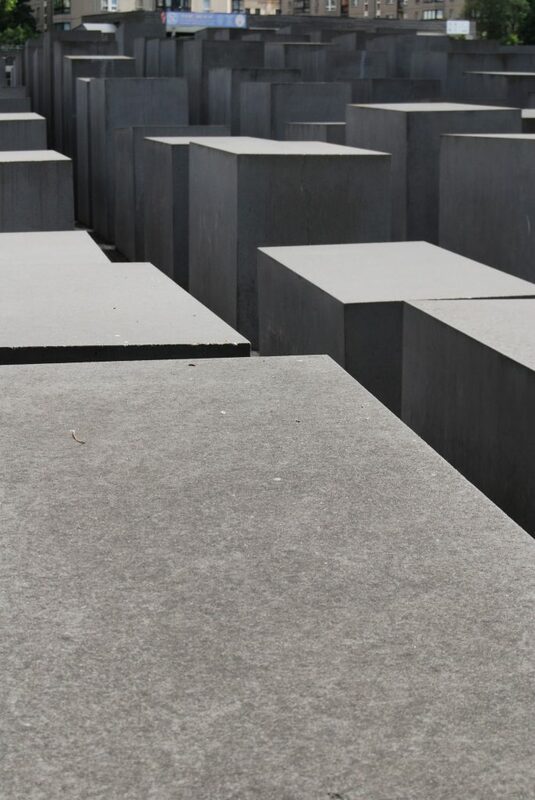 – My afternoon in Berlin with my headphones and time to visit a couple of the more hard to explain (to kids) sights. The parents reading this will understand how nice it was to just be able to roam and not have to stop every five mins for another toilet stop or snack stop. 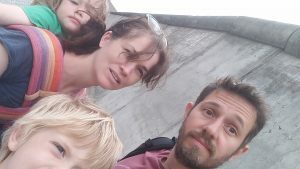 I got to see the Topography of Terror, the holocaust memorial, DDR museum, but most of all I got to walk and make my way from place to place without a pushchair or a child in a sling. It was awesome (I also sneaked in a beer overlooking the river…don’t tell Jayne! – The wall and how crazy it actually was. I knew, I’d read about it before, but seeing the places and understanding the scale is…well…chilling? I’ve come away thinking that Berlin would be a fantastic place to spend a lot longer! Matt and I had wanted to visit Berlin for quite a while now so this was a perfect opportunity… ya know, while we were swinging round that way!! In a tiny period of decent internet access (grrr, this is getting annoying!) we discovered another WomoOase stellplatz in the North part of the city so that’s where we headed! For 30 a night it’s the cheapest way to see a big city – we went straight in for 4 nights, no messin’ and we ended up staying for 5 🙂 We were pretty excited about being back in a big city even though we were pretty pleased to be leaving our own. Hoping to experience some of the culture, buzz and edginess that’s supposed to everywhere (even with kids in tow). It also turns out that we were missing wandering around shops and MAYBE buying stuff! 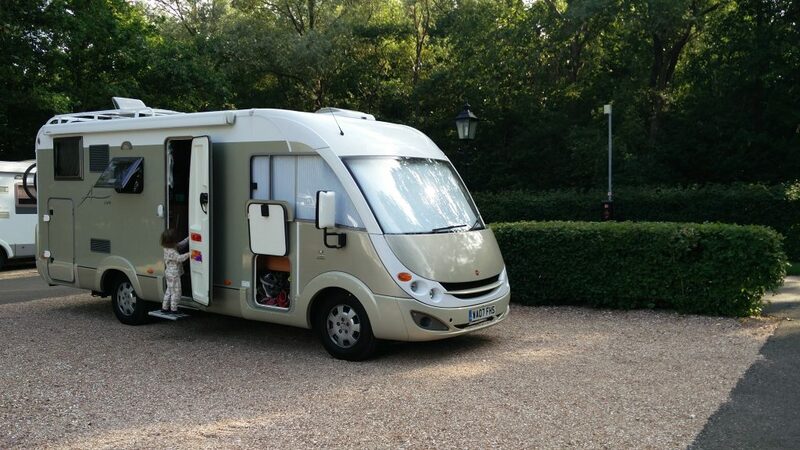 Its been about 4 months since we bought anything (apart from a huge motorhome obvs) and its so nice that this whole process made us sort out everything and give away or sell what we didn’t need. So not buying new things is part of that too, but the lure of “cool” shops was getting a bit much 🙂 Also we had discovered that our friends were in the city at the same time as us and could meet up, Woop! Our first day was an unplanned wander from the main square Alexanderplatz. We pretty much wandered all day but felt that we never really found anything great. 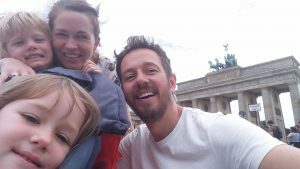 We ticked off a couple of big sights – Berliner Dom, the river, Brandenburg Gate, Tiergarten, etc, but we never quite found the “nice” centre you often find in big cities and sometimes it felt a bit rough. It’s not a pretty place but I think the charm is in the people, vibe and history and that takes a while to come through. 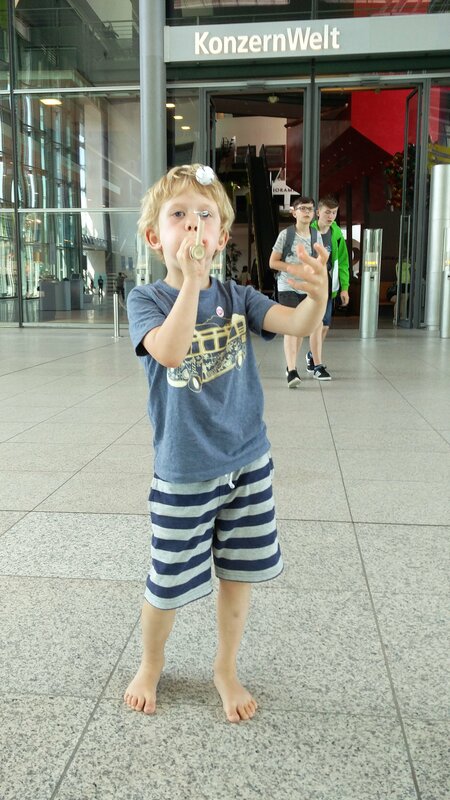 Anyway, we managed to hook up with the Marchevski’s at Potsdammer platz and hoped to get a drink/dinner but the kids were over tired and we decided to just get the train back after only a half hour catch up. Another monument… another selfie. Sorry! 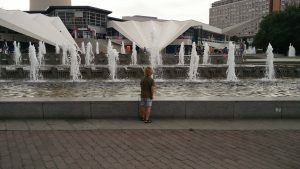 This boy loves a water feature. In fact, we should have done a separate page for town fountains! Day 2 was absolutely lovely. 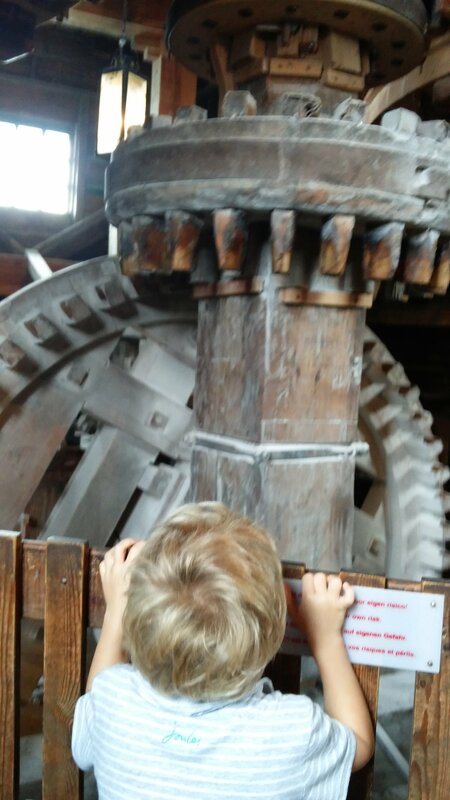 We went a couple of stops on the U-bahn to a local kinder museum recommended by our friends. 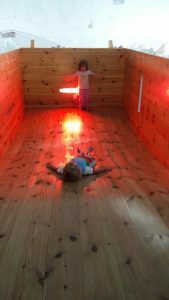 It was a very simple space with an area for some crafts and a big wooden climbing maze. 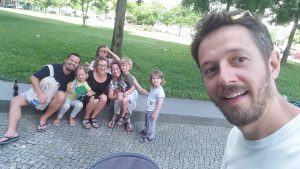 We just hung out there until lunchtime then headed to the other end of the city to Tempelhofer Feld where we had arranged to meet Marko, Elena, Angelina, and Marina. 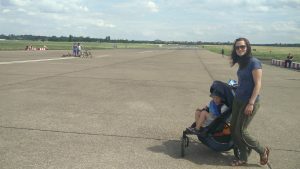 We walked right across the huge airfield which is now an amazing public park – people rollerskating and cycling and even kite boarding up the disused runway! Deck Chairs, bar, kids playing in the shade… perfect! Then they (and their other friends who were also there) took us to a fab Turkish restaurant in Kruezburg. This was awesome as we’d been a bit lacking in other world foods and veggie options! This felt like the buzzy city vibe in a lovely part of town. Saw some fab shops but couldn’t stop – Nooooooo! Then we went to a gorgeous playground just behind the street we ate in and sat in the evening sunshine while the kids played in water and sand. Excellent. Another late night train ride home and very tired. 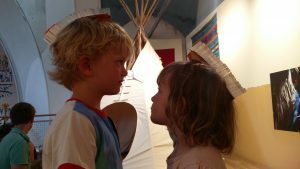 They made American Indian head wear! The view up the runway. 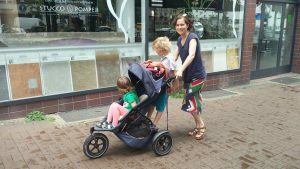 Glad we had the pushchair! 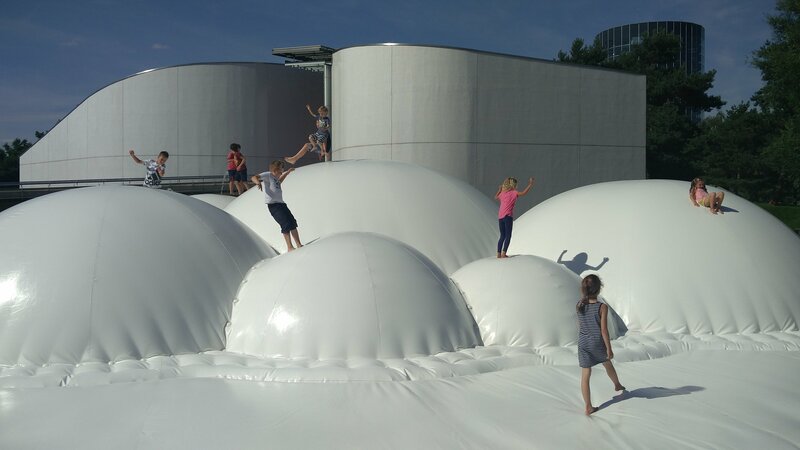 Another amazing play park – Germany is so good at this! 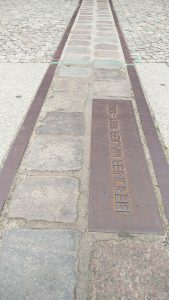 Day 3 we took it easier and walked from the van to Bernauer Straße where the Berlin Wall memorial park is. We had a lovely wander until we were rained off. After a hot chocolate stop we went back to the van to have a lazy afternoon. Matt was then able to go out for a city cycle to a shop he’d earmarked (turns out he’s the biggest shopper in the family!) and grab a beer at the beer festival that was happening! He came back very happy and with the Ortlieb pannier that I really wanted! Yay – a souvenir! maaaaaan, this thing is hard work! Arm workout! On our last full day we decided to split as Matt really wanted to explore some of the more serious museums and sights. 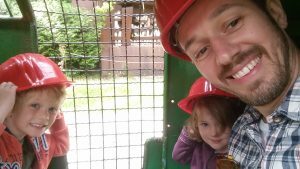 I’d like to think I sacrificed myself as I took the kids to the zoo! It was pretty fun, for a zoo, and we got to see the hippos swimming, and a panda. Yep a panda! I met Matt early evening back where we started our first day, in Alexander Platz, for some food and a trip up the Berlin tower. 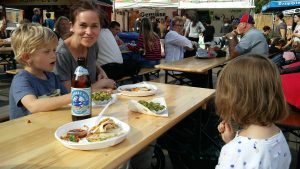 There was a great street food market on and we sat soaking up the atmosphere with our quesadillas, gnocchi and chips. 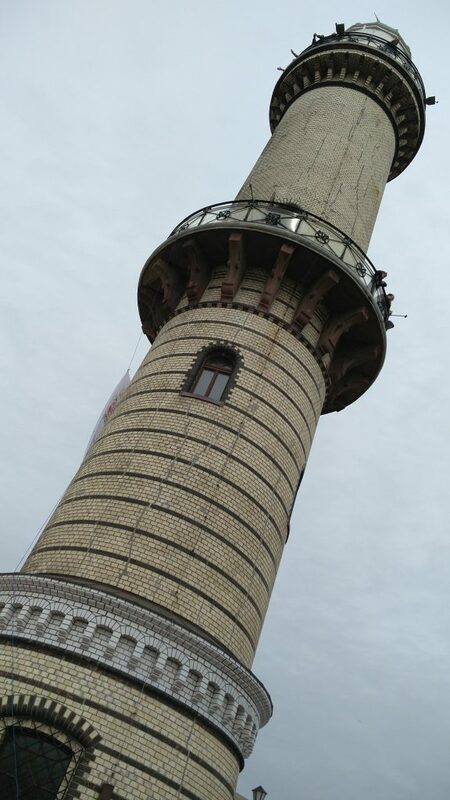 Then off up the tower – which was a struggle as we were all feeling weary, especially Anna who was getting rather difficult to manage. Those of you who know, know! The tower was great and kinda finished off the trip nicely as you could see everywhere we’d been, and also how different the East and West Berlin sides looked. Fascinating. 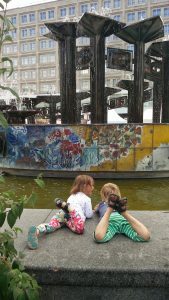 We cant really go out for late night drinks etc with the kids so we completely miss that part of what makes a city great, but Berlin is definitely geared up for kids. 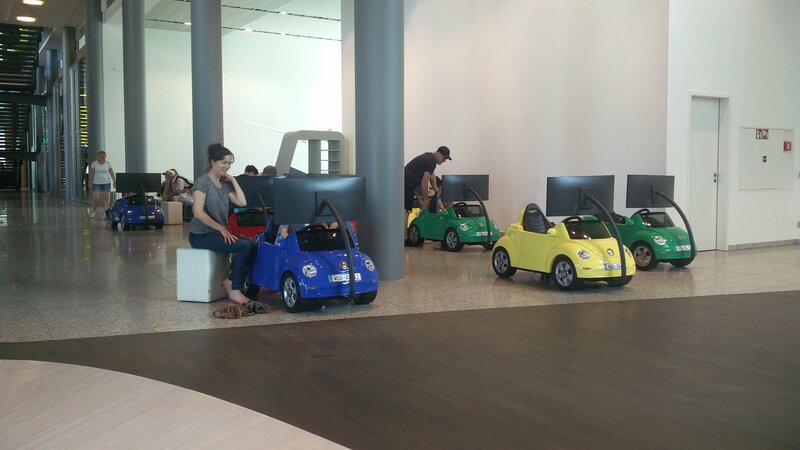 Germany generally has brilliant spaces for children even when you don’t expect there to be any. I know Matt has a lot to say on this subject so watch this space! We packed in a lot into those 4 days and the kids really loved it. 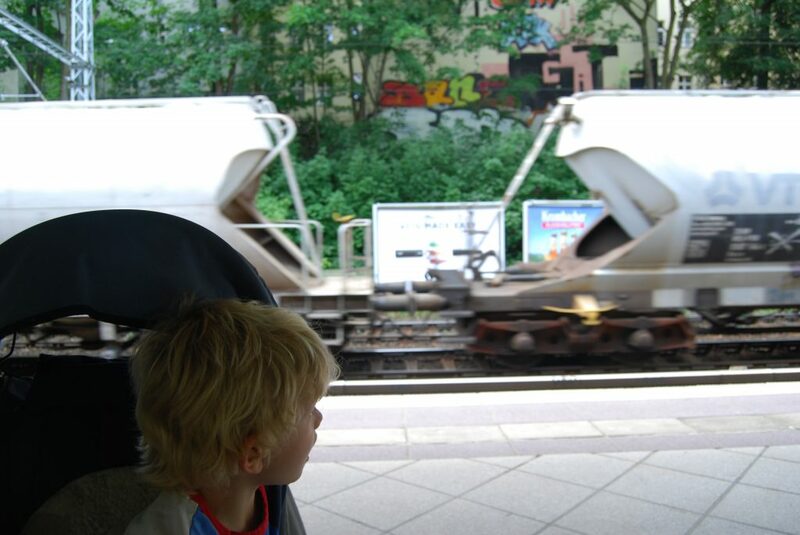 They loved the trains and got a huge amount from seeing new things. They’ve talked about it on and off for a while after, which is great. For me it was a slow burn and I said a sad goodbye to our WomoOase feeling like I was only just getting it. I still never managed to do any shopping, but thats just aswell! Right… lets go South! I love the little chats these too monkeys have! Tall tower thingy. 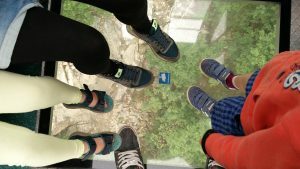 It was high and the lift was super fast! This entry is going to cover almost two weeks so I’ll break it into location headings so we can all get though this! 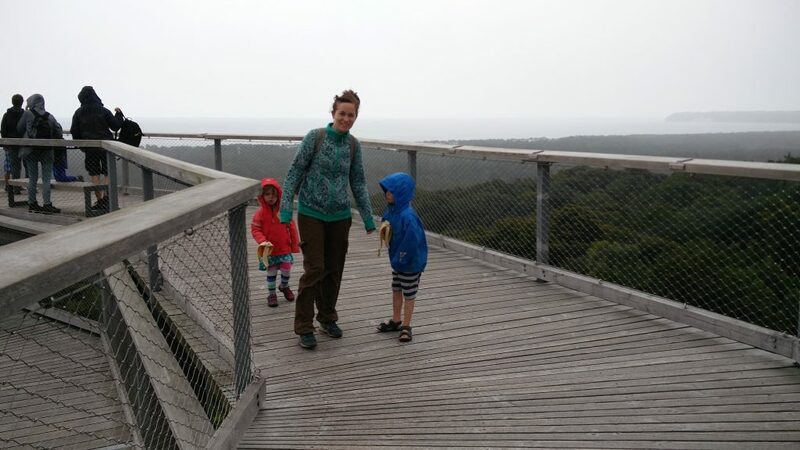 My overarching memory of the Baltic coast will be…rain. We’ve had about four thunderstorms, barely a day without a downpour and the most mosquitos I’ve ever experienced. Our clothes have been damp…our washing has been damp and getting it to dry it has been a real battle…BUT this is such a beautiful bit of coast. Lovely classy seaside towns with glorious, safe, sandy beaches. What a beautiful place, we arrived on a Saturday night (after a quick stop at decathlon where I bought a new chair…very exciting!) and it was lovely to have a quick walk into the town before the kids got too tired. We got up the next day thinking we’d have a nice mooch about…but no…we’d landed ourselves in a town on a Sunday and German opening laws mean that EVERYTHING is closed. It’s something that has caught us out a few times now as this was ditched a long time ago in the UK. 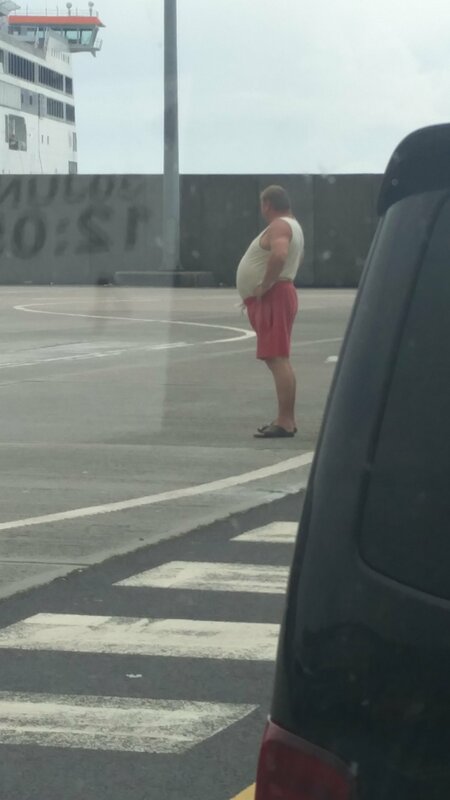 It rained on an off all the time in Lubeck, this turned out to be a trend. 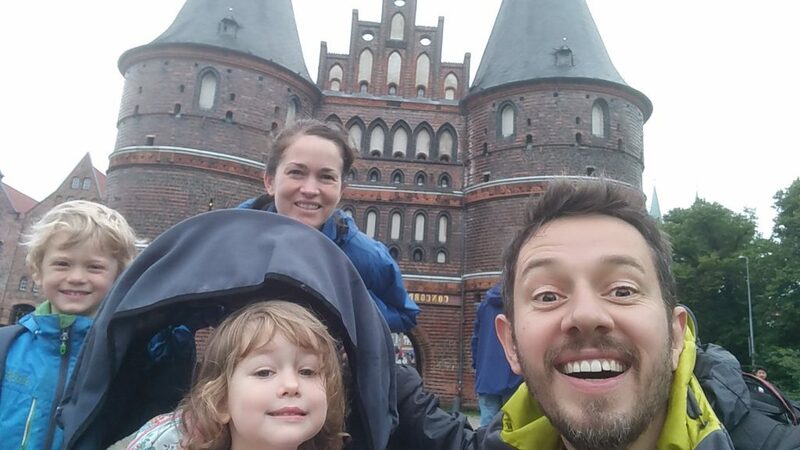 Holstentor Gate, not sure if this was before or after or during the rain…probably all of those things!! 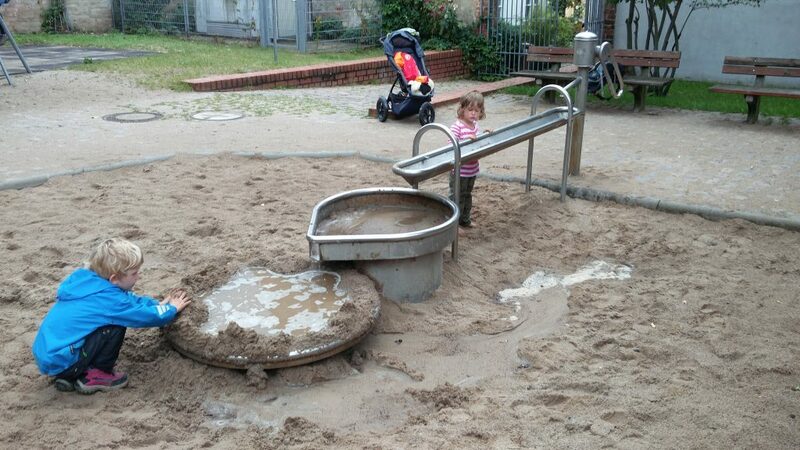 German playgrounds are great…they are everywhere and they are nice….and they are actually kept working! oh, and a lot of them have pumps! Boltenhagen Swingolf – Dry but boggy…from the rain. We drove out from Lubeck and east along the coast planning to stay somewhere simple and quiet. After a bit of faff we found a lovely little stop for just over five Euros behind a cafe and Swingolf place (which seems to be a bit like a glorified pitch and putt?!). We rode our bikes around and marvelled at the biggest slugs and snails in the world, no joke they were huge, massive. The next morning we had our first taste of beach for this trip down in Boltenhagen… and it was sunny! 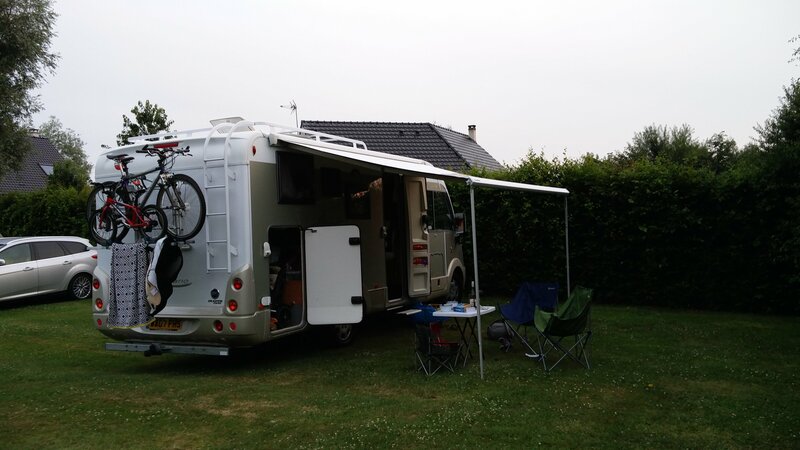 After Boltenhagen we drove further east to a place near Wismar with the plan of a couple of days on a bigger campsite and a day trip into town. 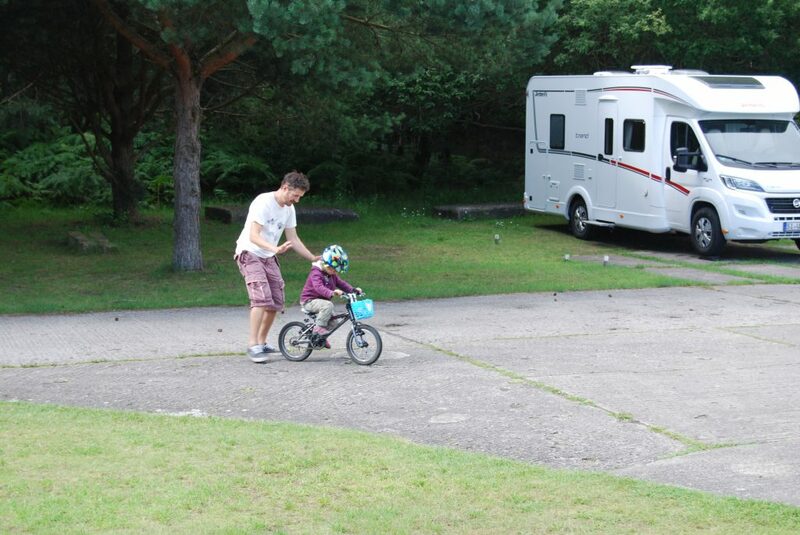 The campsite was the kind of place we’re not keen on, more holiday park, a bit grim, and very pricey. A bit more planning would have told us this, but that would mean taking things a little more seriously which is a bit lame, right?…right? In the end we stayed in their carpark for half price but could still use their loos, win win. Our plans did however get ruined by rain. This time a deluge which had us packing up and leaving after one night as sitting in the van, in a carpark, watching the rain got boring very quick. The change of plan turned out OK in the end though when we found a free carpark in town, had a look round, then went to the local swimming pool. 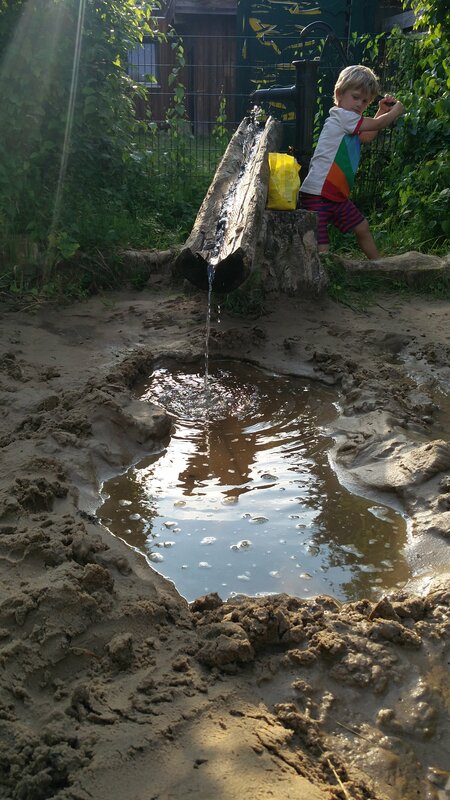 We’d been promising the kids a swimming pool for a while and this turned out to be quite and experience. Loads of slides, a wave machine, and the whole of the rest of the town looking for something to do…bedlam…and two very excited kids. Warenmunde – Some rain, and an eventful carpark. 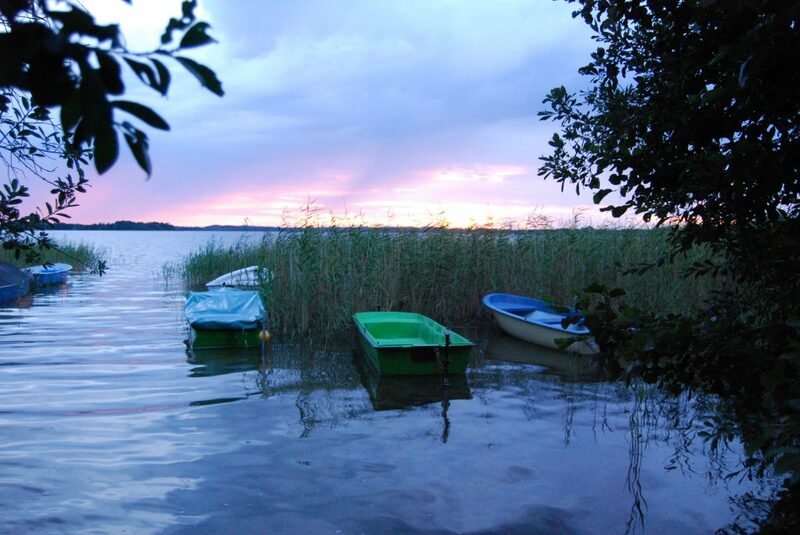 An evening drive from Wismar brought us to the lovely Warenmunde. 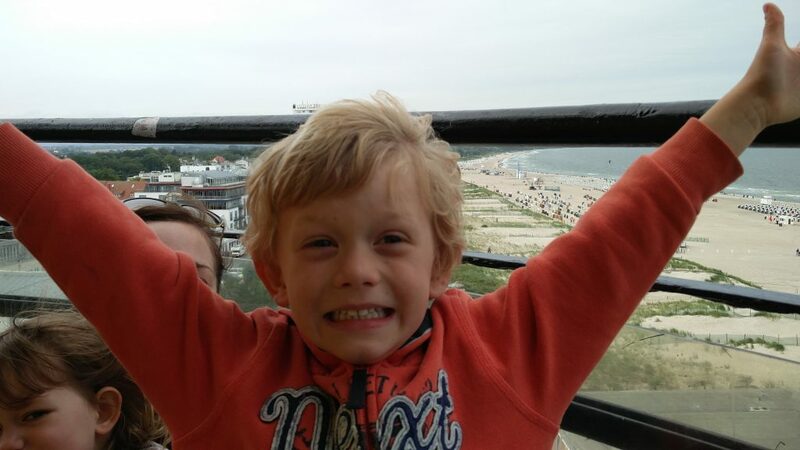 A beautiful baltic coastal town just West of Rostock, with a gorgeous beach and for Aidan the most exciting thing, a lighthouse. We stopped for a couple of nights in a carpark just back from the beach and had a great cycle into town where we went up the lighthouse and looked at all the boats in the docks. We even bought a nice new fancy “stunt” kite which then refused to fly as the wind had died down…doh. After a nice early morning dip on Warenmunde beach we got in the van to head to Rugen. We’d had recomendation for Rugen from friends (Thanks Marko and Elena!) and everthing we read sounded great. We covered quite a lot of ground and topped of the gas cyclinders at a garage in Stralsund, which made me jump when the seal on the euro adapter popped and I had LPG firing out everywhere. 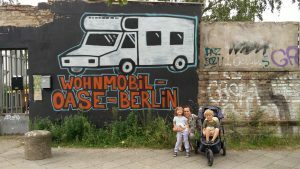 After that bit of excitment we forged on and got to what was supposed to be a one nighter but ended up being our home for our whole stay on Rugen….Prora Wohmobile Oasis! Sitting out one of the rainstorms…about an hour after this it was blazing sunshine….not before it soaked all our washing though. 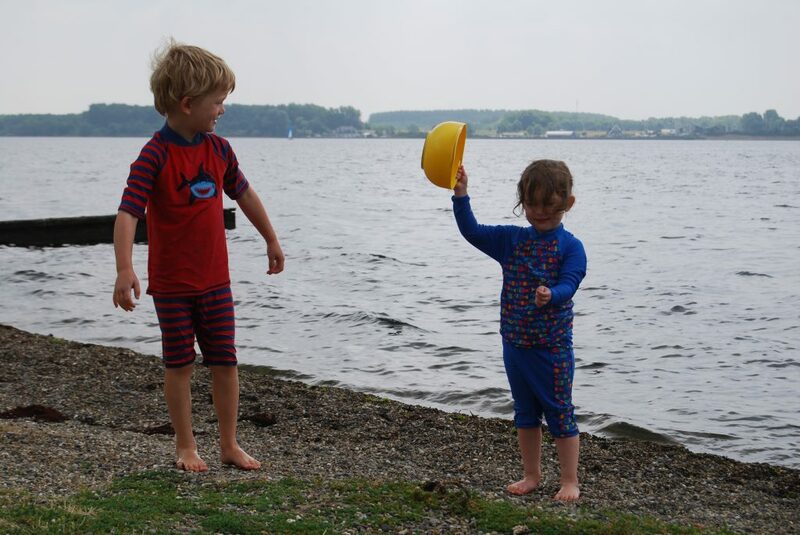 The lake (Kleiner Jasmunder Bodden) just back from the beach was lovely too. Rugen has a lot of different things going on in a small space. Looking out into the lake. – The beaches, which were long, sandy and really shallow shelving so lovely and warm. Within seconds of arriving at any beach Aidan and Anna started digging holes and building big reservior systems. 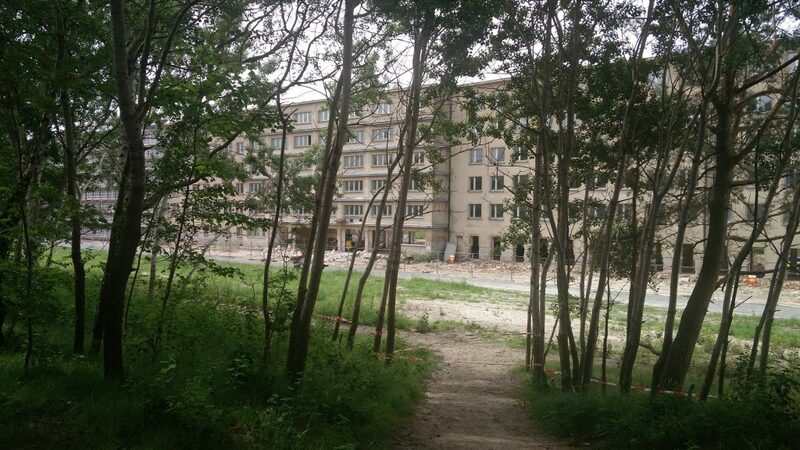 – The ruined Nazi resort at Prora that is now being re-developed post re-unification but must have been an amazing and spooky sight in the 80s when it was all ruins for miles and miles. 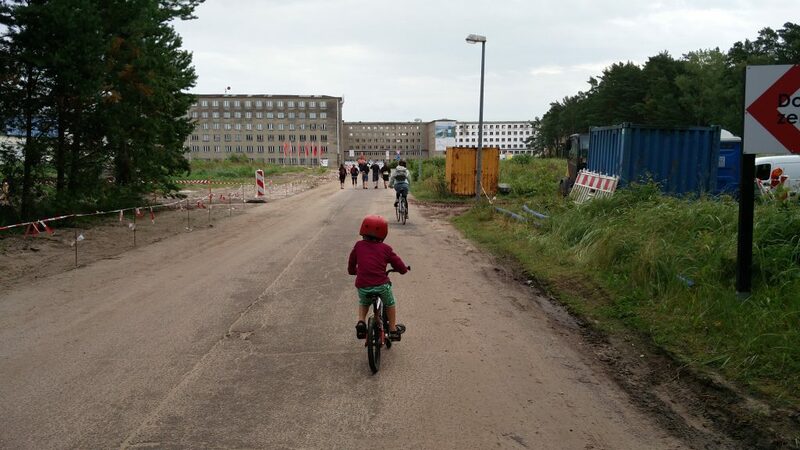 Riding down to Prora, this was the Kdf Nazi resort nearly 3 miles long. Just behind it is a beeeeeeautiful beach. Some of the old blocks at the the beginning of being re-furbished. 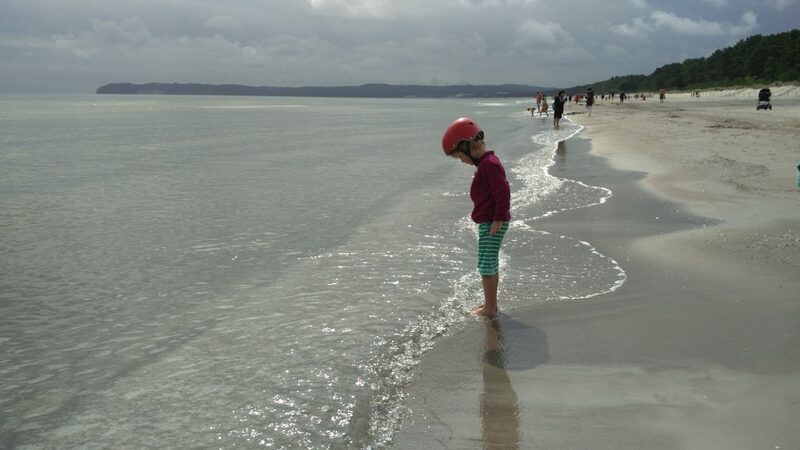 – Binz, beautiful seaside town, but not in the Skegness way, a lovely classy mix of beachside bars and bucket and spade shops. After Warenmunde we’re figuring they know how to do the seaside on this coast! – Cycle paths through the woods and along the beaches, we rode for miles and could manage completely without moving the van. 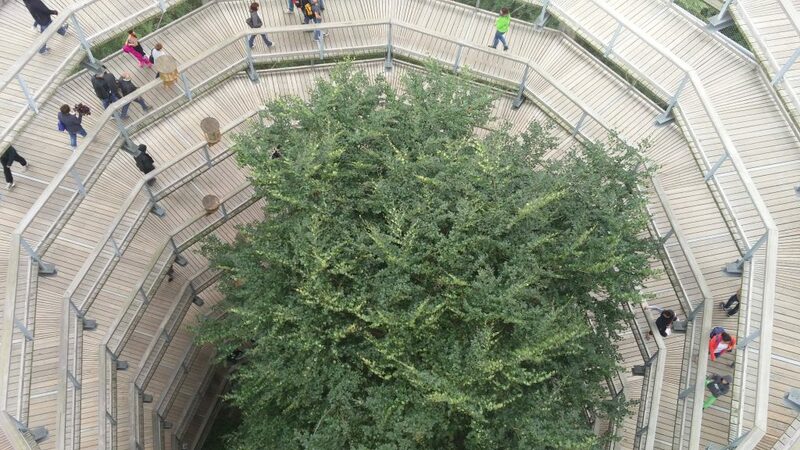 – Naturerbe Zentrum, a cool woodland nature centre with a treetop walk and massive tree viewing platform. Also a lovely cafe with veggie options…woop! 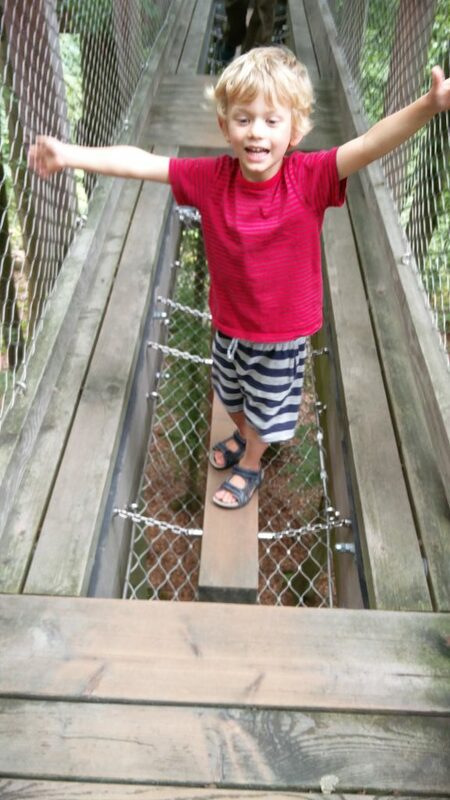 Lots of balancey challenges on the treetop walkway. The view of Rugen from the top was awesome. Down the inside of the viewing tower. – Aidan’s top would be HMS Otus, the British submarine that an enterprising guy bought when it was decommissioned in 1990 and moored up for people to view. SO MANY BUTTONS AND PIPES! 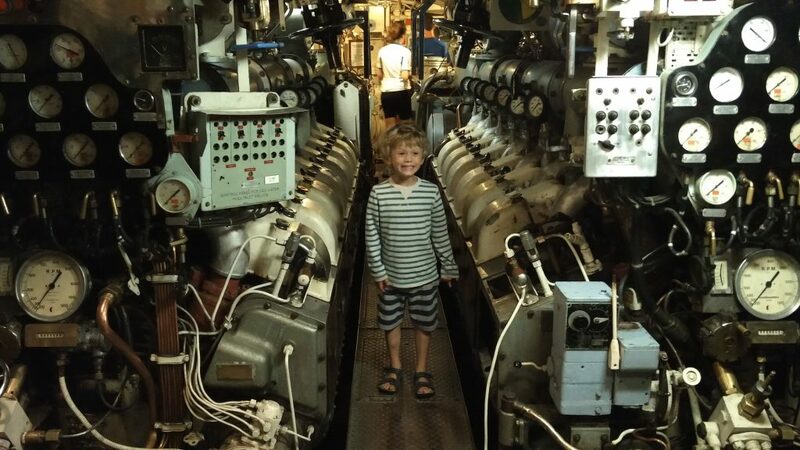 A little boys dream…pipes, dials, switches, and two massive engines! And maybe my favourite bit…. 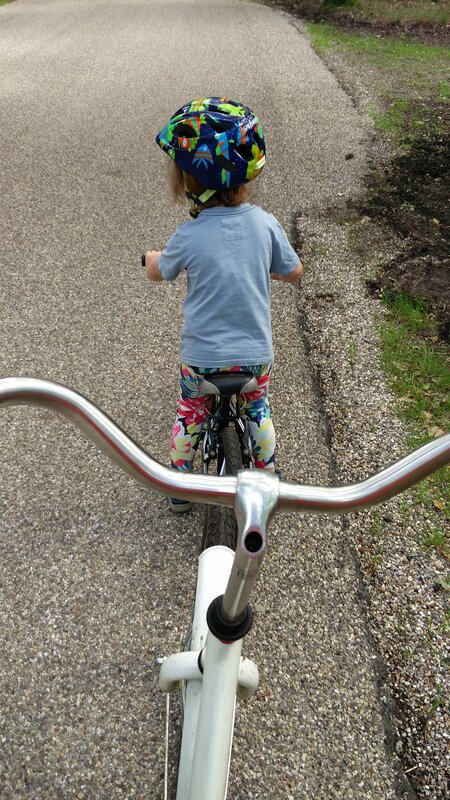 – Anna learning to ride her bike with pedals, she is one determined little lady!! “I’M DOING IT” She was so pleased with herself…and was so determined….watch out world! 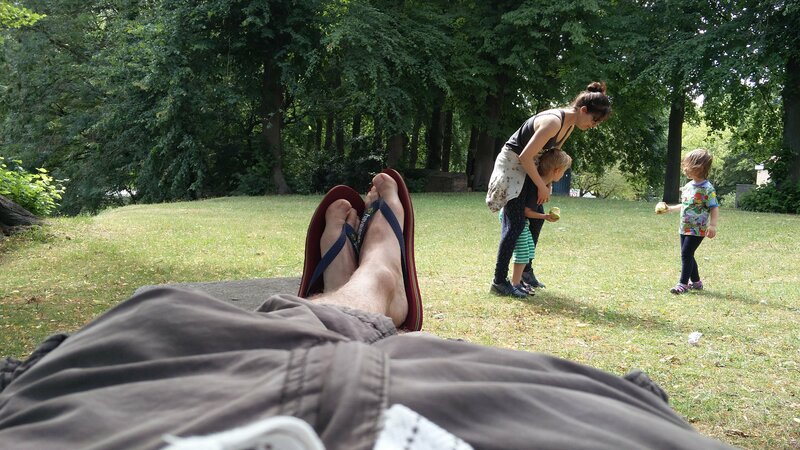 Moving south to Berlin and Parsteiner See – Finally some lovely weather, but oh boy the bugs! After five nights on Rugen we were feeling itchy to move on (the travelling life is finally getting us) and we struck out for an evening drive off the island to head south. 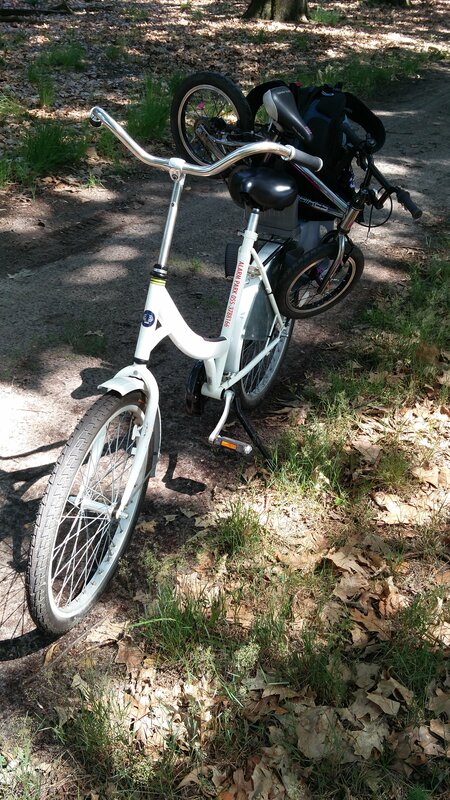 We had a nice little stop in an empty field in the middle of nowhere then moved on to try and find a campsite just shy of Berlin that had been recommended to us (Thanks Tibor/Hensi)…but couldn’t seem to find it anywhere. A friendly local lady took pity on us and sent us off to somewhere which maybe wasn’t where we were aiming but was gorgeous. An old fashioned strip of a campsite along the side of a grogeous lake two kilometres from the Polish border. super relaxed and family oriented with the focus being on swimming in the very shallow and perfectly clear lake. 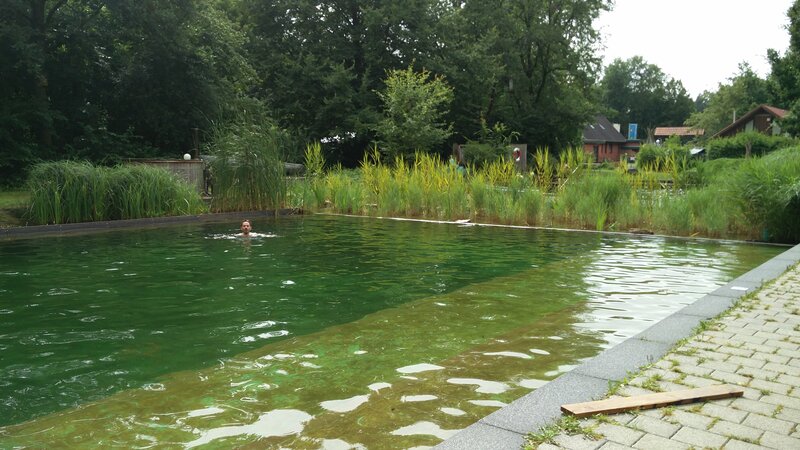 We were on a bit of a schedule as we wanted to get to berlin to see friends and only stayed for one night but evening and morning swims were both beautiful. 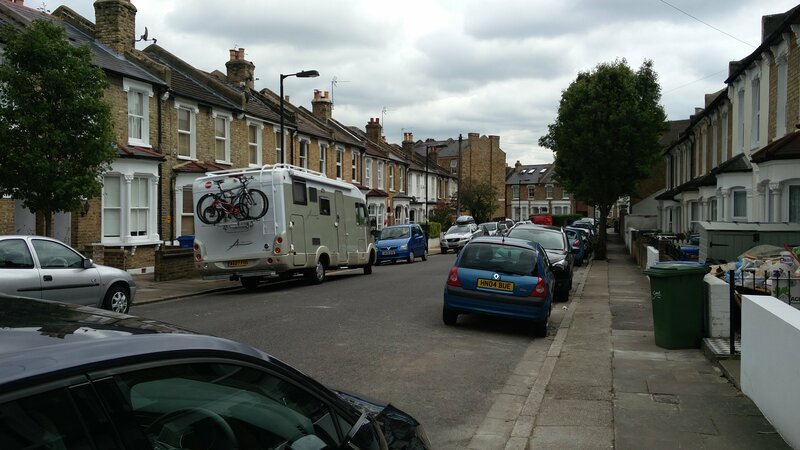 One thing that was very noticable was a lack of big motorhomes (like ours!!) and many more retro caravans, it all felt like we could well be in the DDR in the 70s….FKK swimming for the locals included! The swimming lake at Parsteiner See, shallow way out, sandy bottomed and clear. Idyllic. 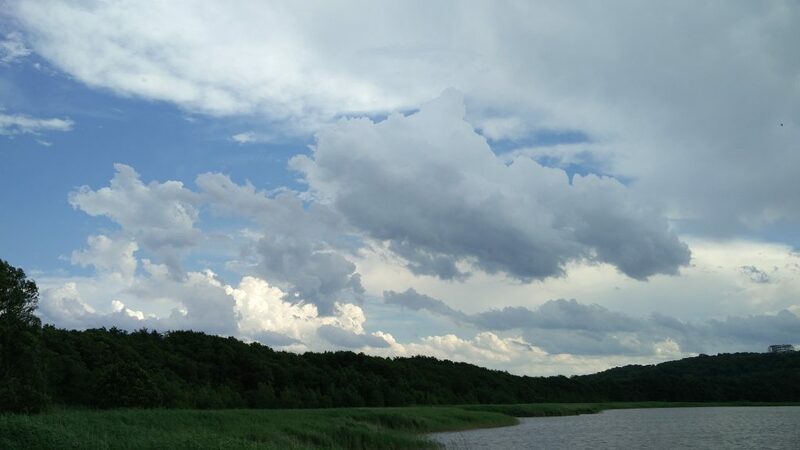 Camp Seppo…I think I’m starting to relax a bit. 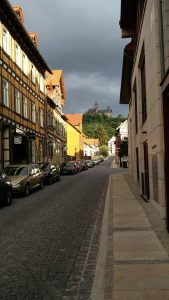 We left the supermarket in Wernigerode and went off into the woods to find somewhere to park up and have dinner. 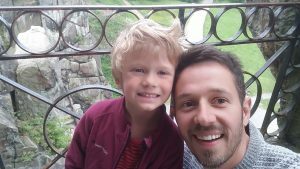 We found a walkers car park and stopped for a few hours and it was lovely, we had dinner, we had a little bike ride into the woods and then we were ready to head off for an evening drive to Wolfsburg. Wolfsburg was the first piece of the plan for the next few days and it was mostly my choice. Most people won’t know of Wolfsburg but it is secondly a small town with a ruined castle, but firstly, the home of Volkwagen! I’m not exactly a car nut but having had a lot of VWs and having been the custodian of a very rusty old 79 bay window for the last 5 years, Volkswagen holds a bit of pull for me. I was thinking that we’d swing by there as a stopover on the way north and drop in at their museum for a few hours as a kind of pilgrimage and to see some old bugs and buses. How I underestimated how it would turn out. We used Camperstop and found a stelleplatz right next to the factory, we didn’t realise it was actually in the factory carpark. It was all nice and secure, a little bit noisy as there was a boy racer roundabout nearby (presumably loads of “max powered” golfs ragging around) but that wasn’t anything a price of 6 euros a night couldn’t help us ignore. We had a decent nights sleep but had no idea what to expect the following day but we got the inkling there was more than a museum from the bigtop we could kinda see from the van, oh, and the presence of a Ritz Carlton. The next day we paid our 30 euros to get into the “Autostadt”. It was awesome. Like a theme park cross with teletubbyland cross with the science museum with a seasoning of car showroom if you looked really hard. 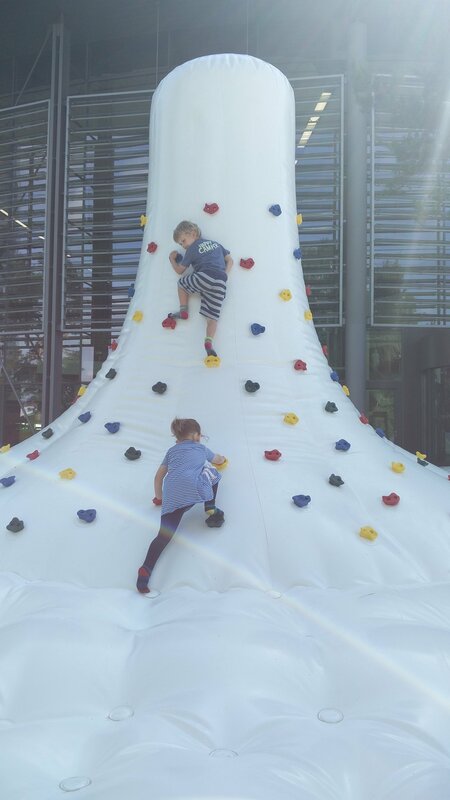 It had inflatable things all over for the kids to bounce on, it had loads of simulators for them to learn how to drive, it had the craziest three floor climbing thing that looked like it had been created by an architect, and for Aidan, “sprayers” and fountains everywhere. Oh, and a car museum, which in the end felt like the least important bit. He’s up there….on the top of the biggun! Both kids got to make this ball airlifting toy from scratch. No queues, nothing we just wandered up, they cracked out the pillar drills. Awesome inflatables everywhere, top age limit 13, #sigh. 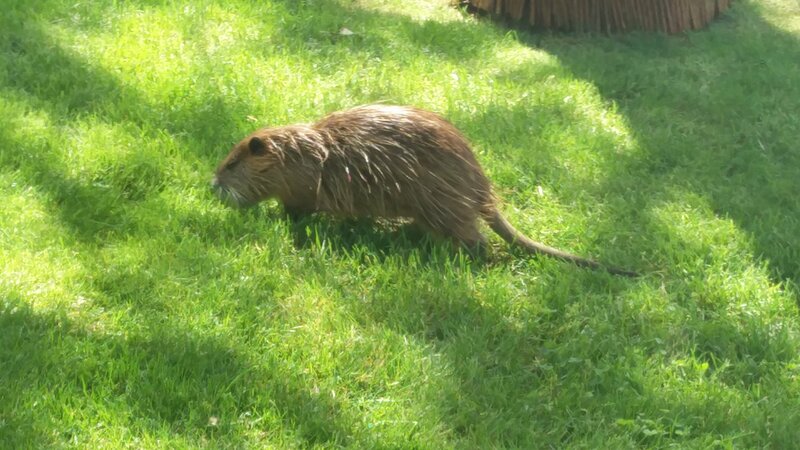 I thought I’d found a crack in the perfectness…i thought it was rat…no…Coypus roaming the grounds….really???? We ended up staying for two nights so we could spend a full day there and we still didn’t get to do the kids driving bits or the lake swimming right outside the factory power station. Maybe next time. After all that excitement our next stop was well needed. 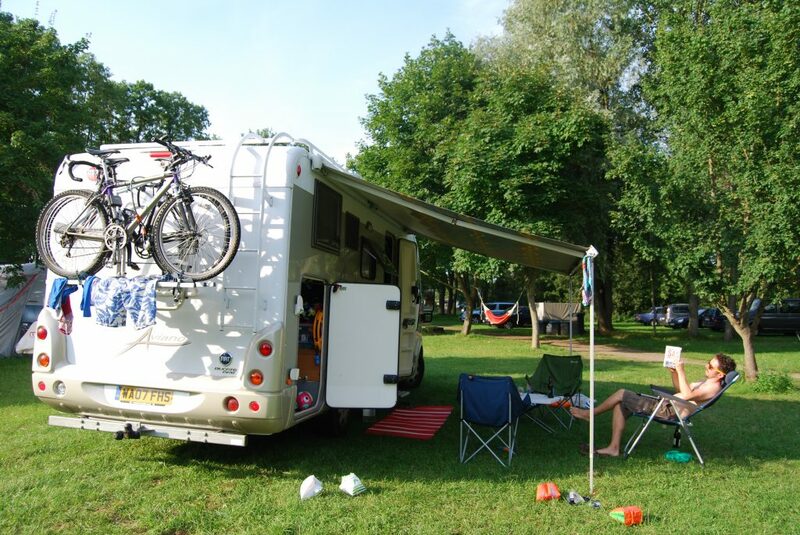 We headed to Uhlenköper which is a lovely quiet campsite which is much closer to what we’re used to back home. It’s chilled, all a bit eco, and it had two things that kept the kids and I happy. Firstly, a natural swimming pool. picture a normal pool but with reed beds down two sides, water like lake water, and loads of tadpoles and water snails swimming with you. Something really pretty special. Me swimming with the fishes, well, the tadpoles and snails. 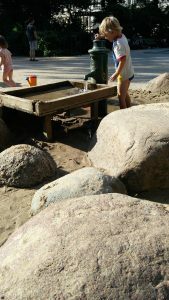 Secondly, an old fashioned pump and a sandpit, sometimes its the simple things, especially with my little engineer kids. We stayed three nights, and really felt like we relaxed. We wavered on staying another night but didn’t want to have to skimp on the Baltic or Berlin before we needed to head south so decided to move. Felt quite sad to be leaving The Netherlands but the expanse of Germany awaited and we had been looking forward to exploring this country. Even so, we were unable to decide on a plan for the next few days. We thought we’d have had more free time for planning, but it hadn’t felt like we’d had much free time at all. Last minute decision we chose to drive across to Bremen as it sounded lovely and was only a couple of hours drive away. The sat-nav journey time didn’t seem to be decreasing very much and the kids were really unhappy passengers, so we stopped (Lidl shop stop! ), regrouped and changed our minds back to the previous days plan of heading more into central Germany. 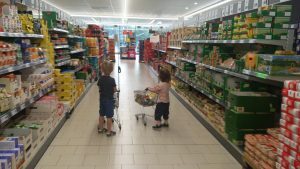 Lidl have kids trolleys… absolutely the best thing that happened to them today! Matt found a free overnight parking place by lake Dümmer which mean’t only a short drive. Luckily we got to enjoy this and the lovely playground for an hour or so before it started to rain, and it didn’t really stop raining for the next few days. The next morning matt took the kids on a rain walk around the lake while I packed up the van. 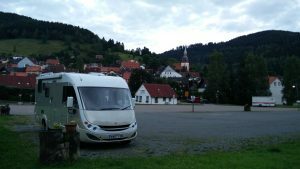 We had now ironed out our plan to start driving further south to the Harz mountains and then slowly back up North to the Baltic Coast. We won’t be able to have another chance to go into central Germany if we don’t do it now. Very rainy morning. Waterproofs at the ready! We made the most of the rainy day by travelling and we headed to an ACSI campsite that had a pool (we’d been promising a pool for our next stop!). A quick stop at our first German bakerai for some lovely bread. I’m going to enjoy the bread here! This campsite was run by a very grumpy man who was almost annoyed that I was bothering him. Also the pool was closed due to bad weather… oh dear (how can a pool be closed for a bit of rain?!). We paid for 1 night and got all our washing done. 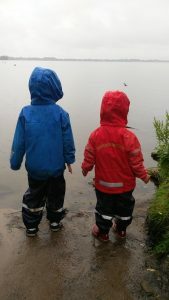 We had lots of fun exploring the toilets and other facilities (in the rain) – this seems to keep the kids occupied for hours! The next morning matt found a tick on his leg! This was quite scary as he was reading up on all the things that could go wrong. We packed up the van quickly and went to the local doctor while the kids and I wandered around the little town park. There always sees to be an interesting playground around every corner. Matt got some good advice and was looking a lot happier after seeing the very nice doctor. (and also a quick chat with Dr Dr Paul!) 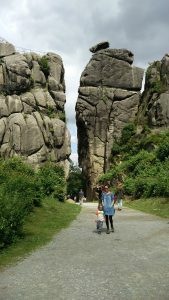 We continued with our plan and spent the afternoon at Externsteine. This is a collection of unusual vertical rock stacks in a national park. Had such a lovely walk in the woods, the kids loved it. But after just commenting on how much better Anna is at not falling over so much she had a really big fall and smacked her forehead on the stony ground. Poor girl… she hurt herself pretty badly. I carried her all the way back to the van where I could check she was OK. She was fine but had a big bump on her forehead and some other cuts. Matt took Aidan back to the stones and they paid to climb up to the top. It’s nice for Aidan to do some stuff without Anna sometimes. Climbing to the top of the rocks selfie! 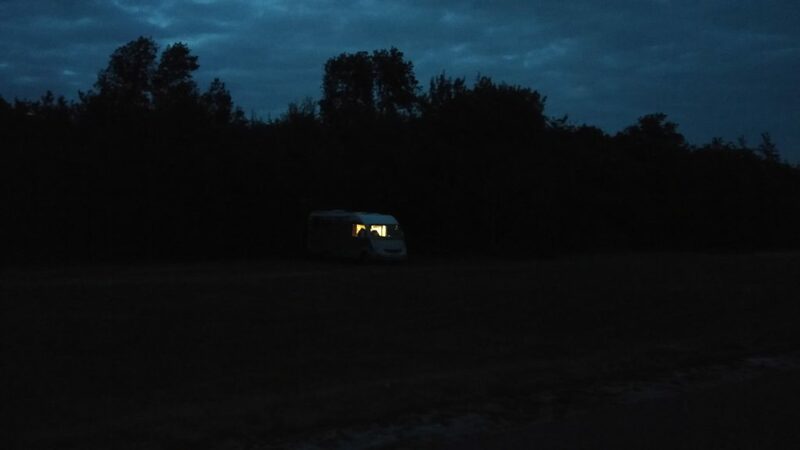 I made dinner in the van in the beautiful car park and we stayed there all evening until closing time. These simple things seem to be the most enjoyable – and feels kinda strange still that we can just make food and do everything wherever we are! 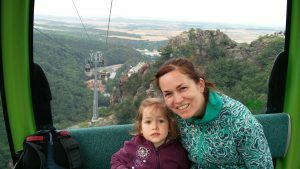 Pyjamas and teeth, then a night drive over to the Harz mountains. We stopped at another Stellplatz in the mountains and this one was also brilliant. 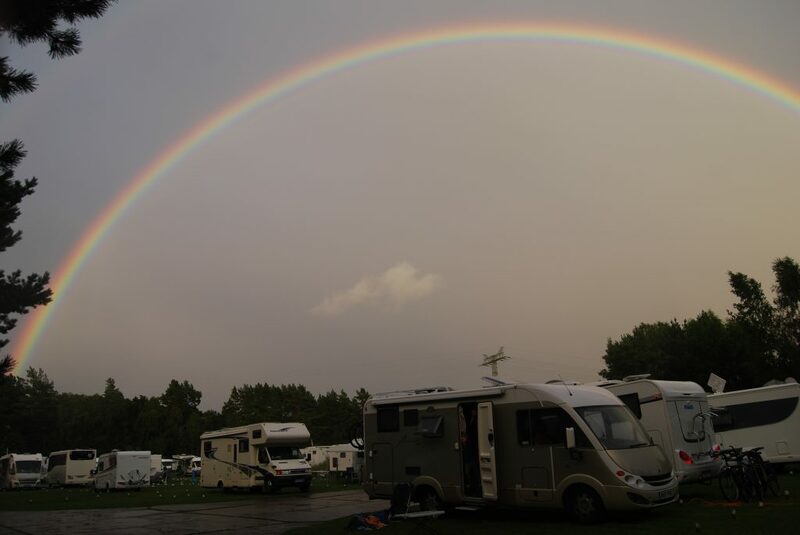 Only 1 other camper in this huge carpark at the bottom of the pretty German town – Launtenthal. Great overnighter… Burstie is looking pretty happy! Woke up to the sounds the river and had our breakfast on the grass and the kids rode their bikes all around. Discovered this village had some old mines and we went into the museum just opposite the carpark. Ended up here for a few hours as it had an underground boat experience and mine tour! The kids had a great time. Off we went to the next village where there was more going on, but the kids slept straightaway. We parked up unable to do anything so decided to take our chance with the sleeping children and just go straight to another campsite where we could hopefully stay a couple of days. Pool still needed to happen! 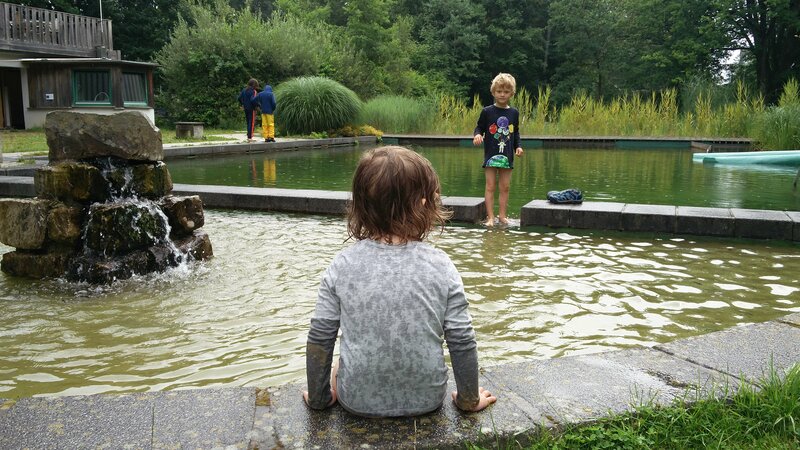 It was a lovely campsite in Hohegeiß, but the pool was an extra cost. Luckily the next day was the summer party and free swimming all day! Bit dreading that, but turned out to be really nice. Had party music playing all day. The massive pool was on the edge of the woods and wasn’t busy at all. Matt and I both had lovely swims. We had pretty much run out of food so went for a walk up to the town only to find the shop closed. There was no-one around and it didn’t seem like anything else to do. We were missing a town or some other life. We had a few hours of time that evening and it was nice to get a plan together for the next few days. 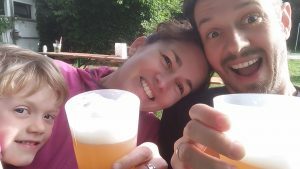 We both felt like we were not settling into our first week in Germany. 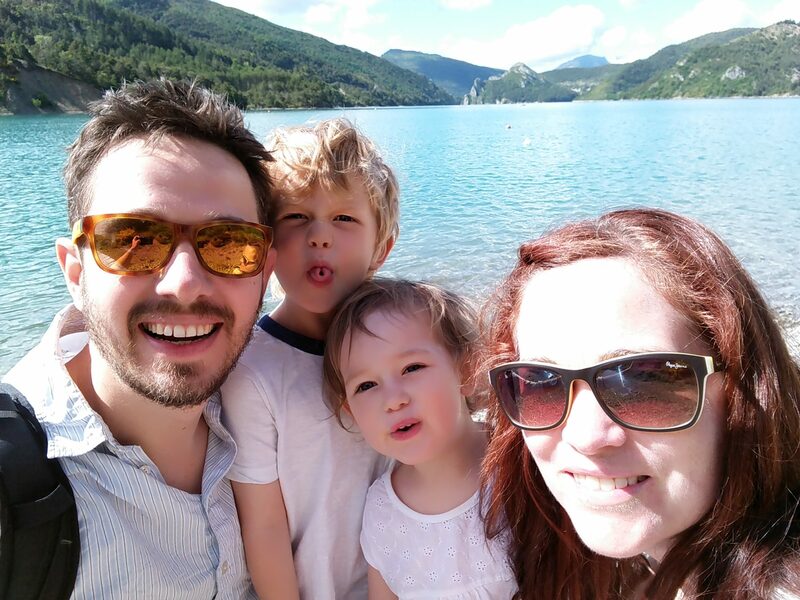 Not sure why, but a bit like we were missing out on things near by or not able to make the most of where we were (obviously can’t do long walks\biking in the mountains etc with kids and that can be frustrating at times). Anyway, we had a plan – onwards! On the little mining train ready to go in the mountain! 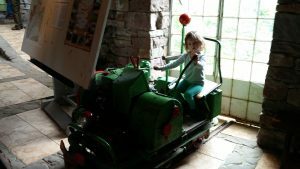 Anna loved this train thingy! Me (jayne) in the distance! My post…my title! This is going to end up being a longer one from me for the end of our Netherlands epiphany. In the end despite it’s loveliness we did end up leaving Delft on the Friday morning. 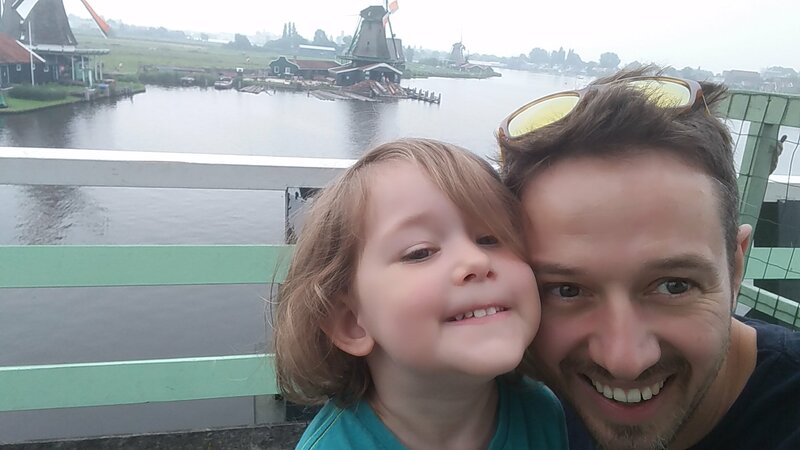 We were a little torn but we wanted to take the kids to do something really Dutch on the Friday before the weekend so we decamped and went to see the windmills at Zaanse Schans. They were awesome. 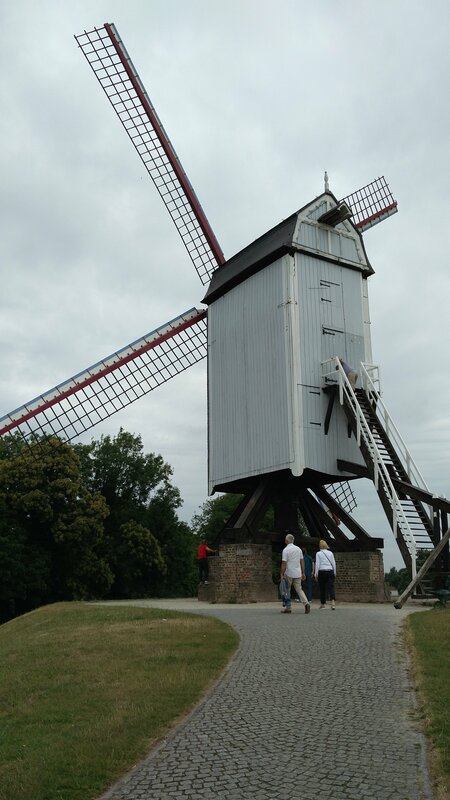 There was a touristy village bit with clogs and cheese and trinkets but the windmills were great, especially since it was windy enough for them to be running. We took the kids round three of them, dye grinding, oil pressing, and a saw mill. Being able to wander round and see them all running was pretty impressive. Me and my Anna…that’s her new “cheese” face. If you know my boy…you’d know this was heaven. 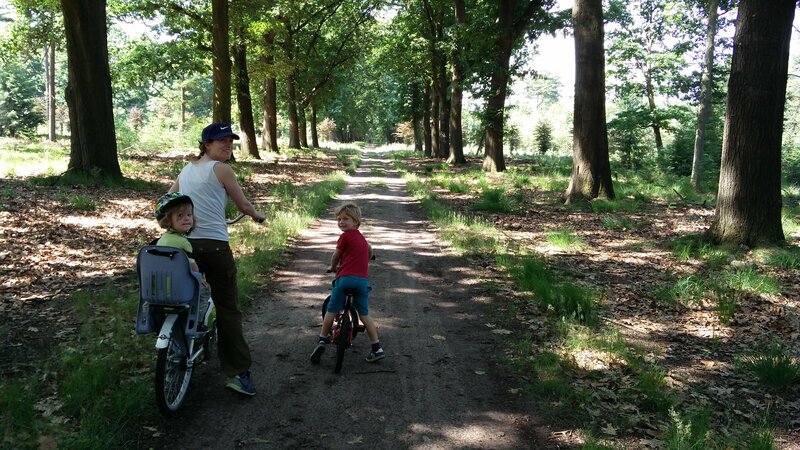 After the windmills we headed off to Hoge Veluwe National Park. We stayed in their campsite which was lovely and much closer to the kind of camping fields we’re used to staying in with our other van (should do a page for that!). Open meadow, lovely facilities, pitches roughly marked and not really adhered to. We wanted to give ourselves a break as we felt like we’d been moving a lot so we decided to stay two nights, which in the end turned into three because the park was so great. The park was the same as the rest of the Netherlands, based around bikes. It’s mostly forest with some open land that is supposed to resemble the African veldt. Its all criss-crossed with bike lanes full of people on “white bikes” which are free to use anywhere in the park. It has an art gallery and sculpture garden but predictably all we did was ride around the woods exploring for two full days. Aidan is getting EVEN faster on his bike and we’ve finally relented and let Anna have her pedal bike albeit without the actual pedals on, despite it being too big for her she’s doing really well. The other really nice thing about this stop was having company. 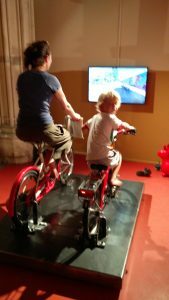 The Hamilton family we met in Bruges had the same place on their list of Netherlands “places to see” and we had a two night overlap with them. The kids loved playing with Edie and Flynn and for us it really nice to have a couple of evenings sitting out late watching bats and drinking beer with Sinead and Steve. The only negative is that I’m now lusting after a fancy torch!! Here’s their blog check it out. We left the park on Monday morning and felt ready to move on. 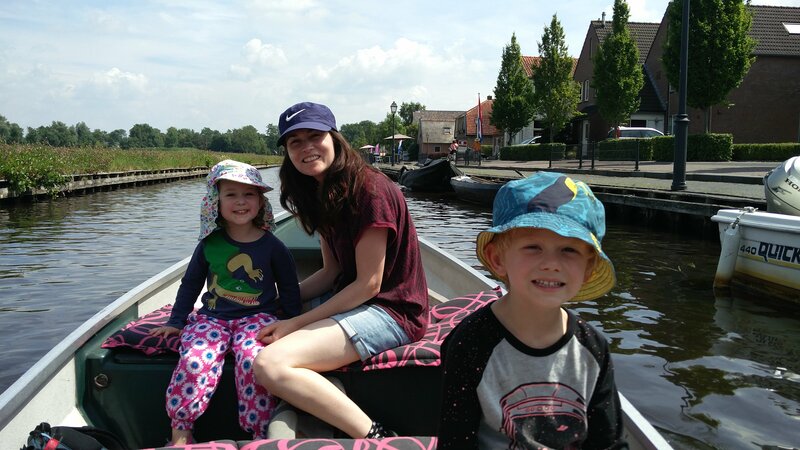 We went north and dropped in on a touristy spot called Giethoorn which is a sort of quaint village with canals for roads. 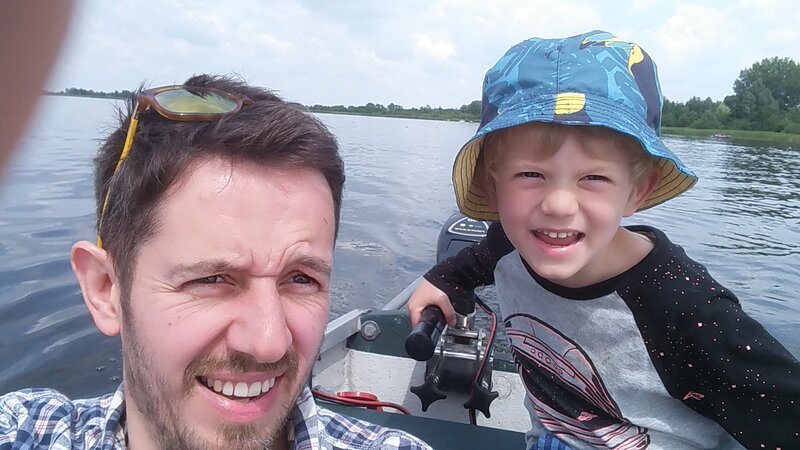 We rented a whisper boat and buzzed slowey about with Aidan on the tiller. After that we started to head roughly east towards Germany and picked somewhere random to stop from Camperstop…and boy what a choice…it was awesome. Five euros got us a stop in a lovely couples piece of land that they had made as natural as possible with ponds and trees. They also had some things that I liked a lot and something the kids liked a lot. 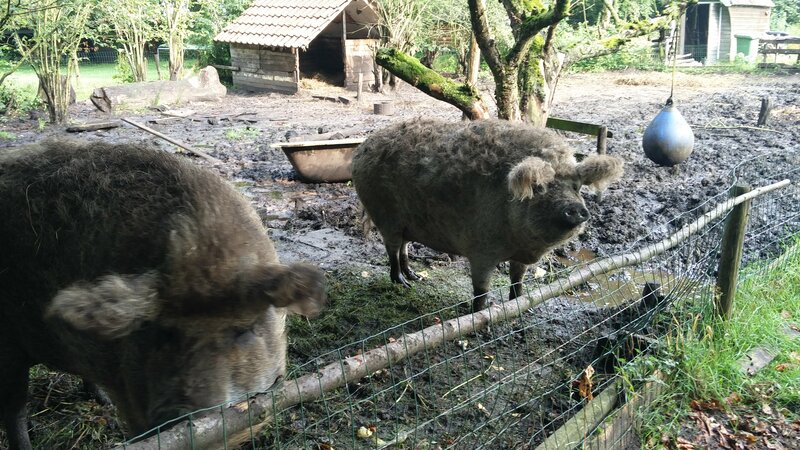 PIGS (Hungarian Woolbacks!) 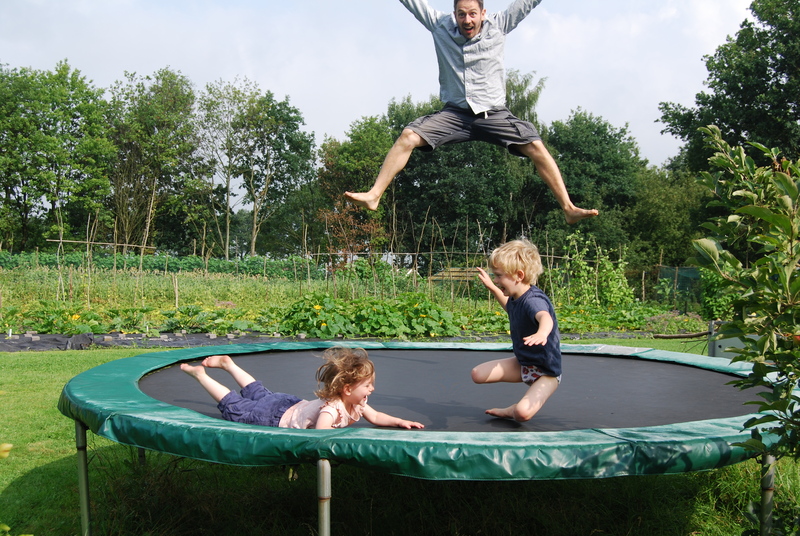 for me, and a trampoline (springy!) for the kids. We got oursleves a lovely pitch hidden away in the wild bit, and settled in, then…..it rained…well…it poured….40mm in about an hour. I started to get nervous and we had to do an emergency reverse through the boggy ground to make sure we would be able to get the van out. We ended up closer to the house which was much nicer as we got to chat to Anika a lot (and be closer to the pigs!!!). My friends…I miss them already. The following day it was time to head to Germany….off we went…we’re leaving the Netherlands having liked it far more than any of us expected to. 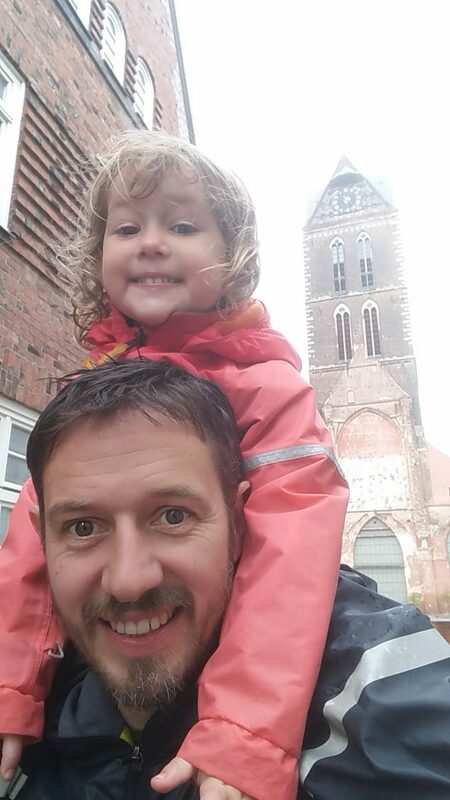 We should have stayed in Bruges for that extra night we’d paid for (by accident)… but hindsight is a wonderful thing. Our sense of adventure kicked in and we wanted to try a free parking experience using Park4Night app to offset the cost of this extra night we didn’t want. 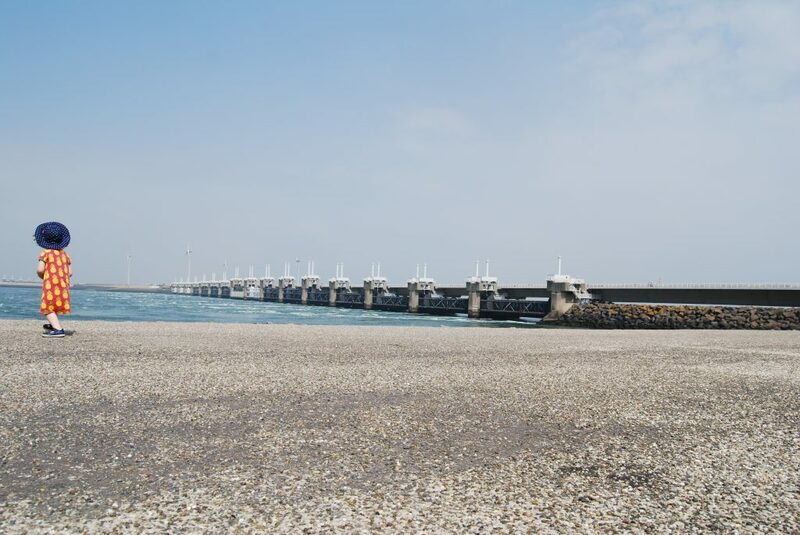 There were loads of stops listed up on the coast near the delta in The Netherlands where we wanted to explore next. 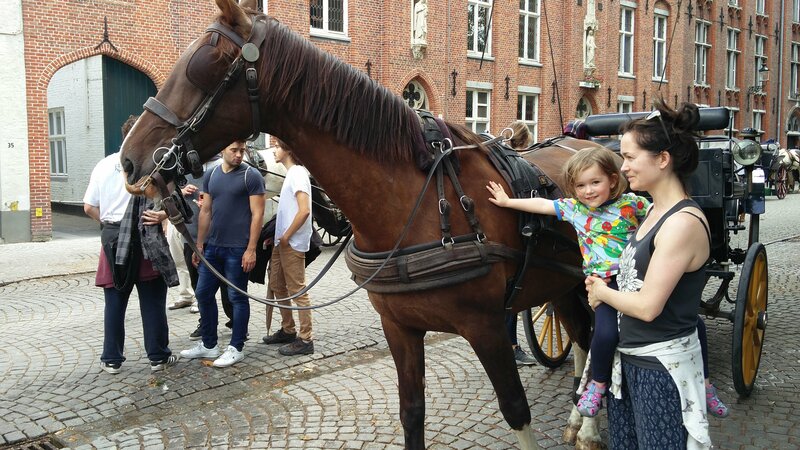 The kids went to sleep as planned and we had a lovely drive into Holland… here comes the but… Anna woke up really upset with achy feet and upset about not seeing the horses, which in turn woke Aidan up who was cross at Anna making a load of noise. Oh dear! We had to pull over for a while and get snacks. A quick check of the app and we decided to stop somewhere nearer, right on the edge of Lake Veere in a region called Kamperland! It was about 11pm and deserted. we pulled up by some bushes in the carpark and thought we were sorted. 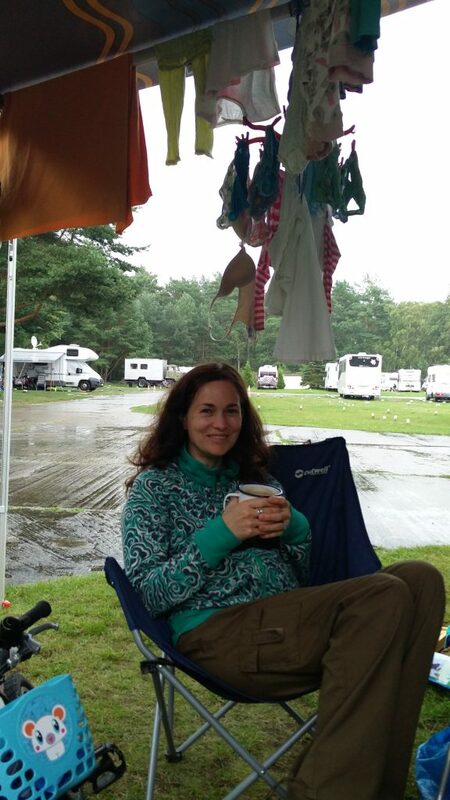 But then we got nervous and googled about The Netherlands free camping rules. Turns out its illegal. 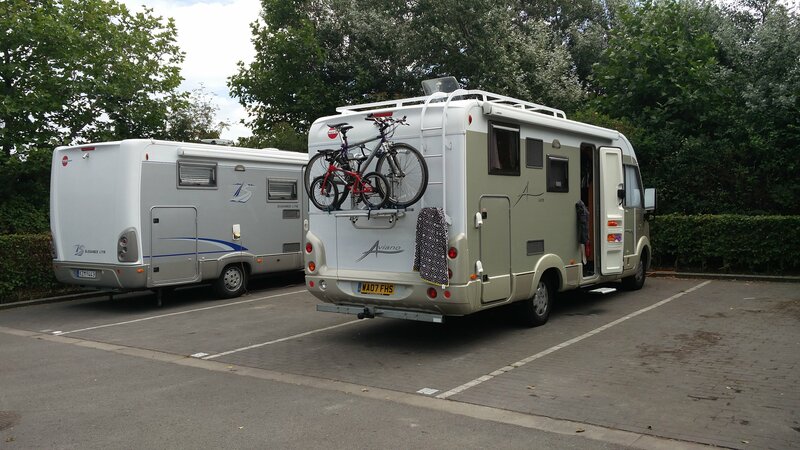 So we moved to a nearby motorhome stopover 5 mins away, which had amazing automated check in with credit card…phew! The next morning we enjoyed this fancy carpark with super shiny facilities and then drove back round to the lakeside where we’d been the night before. Beautiful! Cafe for a power up and the kids had a lovely few hours playing with stones at the lakeside. 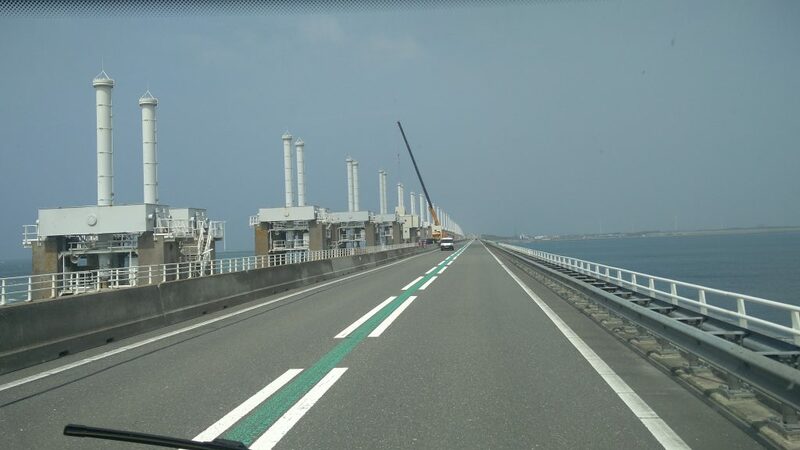 We then headed off to see the Delta works dam and drive across the bridges. This was the main reason we’d taken this route North and it was really impressive. 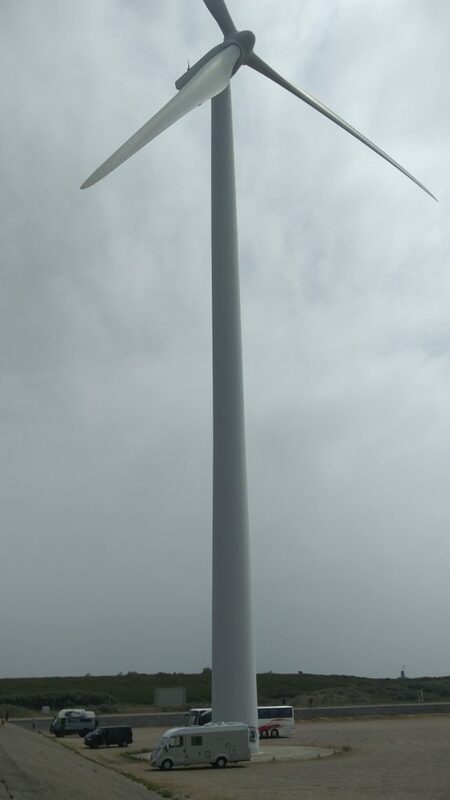 We were able to stop and see one part of the dam close up and also stand right underneath one of the many huge wind turbines! We got to our next campsite early evening up in Rennese just behind the sand dunes. We decided to stay 2 nights here to slow things a little and enjoy the location. 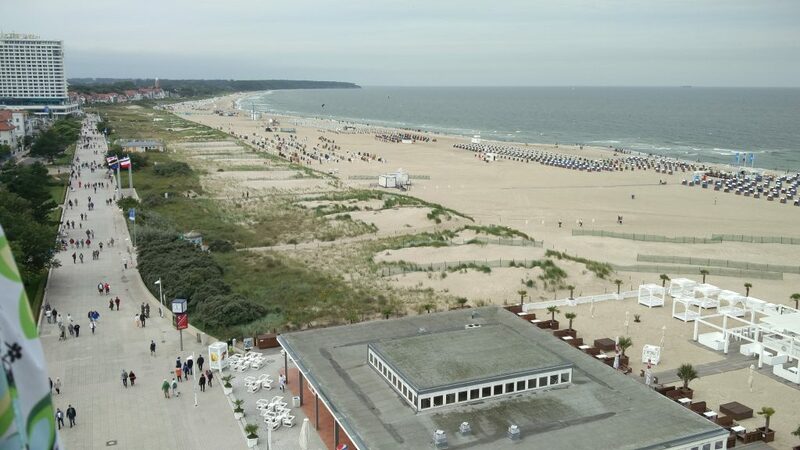 Didn’t have a great feeling about this campsite but it was fine and the kids got to enjoy the beach, swimming pool and easy cycling into the buzzy seaside town. The bike lanes are fantastic, it is so lovely to see everyone meandering around on their bikes. Aidan is loving his bike and we felt confident enough for him to go on the road into town! Matt and I sat and made a good plan of what to do next. 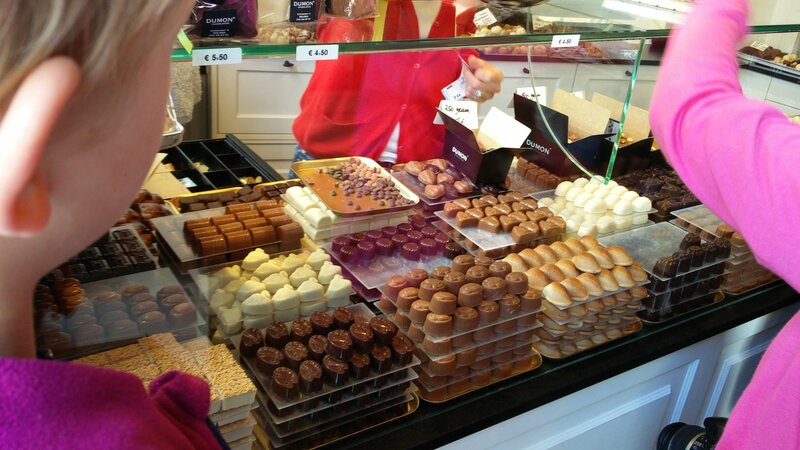 We definitely want to enjoy more of The Netherlands. Guide books and maps out (my favourite thing to do!). Early start on Thursday up to Delft via Rotterdam for a quick hello. We hoped to have an easy stop in this city for a few hours but turns out this was a foolish idea in a motorhome! Need to get used to having this vehicle and its limitations. Matt did brilliantly and we ended up stopping on a small island just south of the city centre. 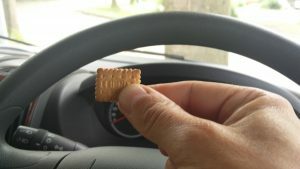 Had lunch in the van and explored the immediate area. Boats, bridges and a playground. The kids were pretty happy! We didn’t’ attempt anything else and made the quick drive to Delft. 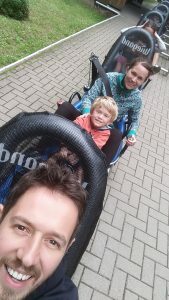 We stopped at a great campsite just outside this beautiful Dutch town, and then enjoyed the rest of the afternoon in the playground and the kids on their bikes going up and down our section of campsite. Anna is desperate to ride the pedal bike so Matt took off the pedals and she can now use it as a balance bike. She is so determined! Great location but not brave enough to risk the fine. Our “official” stop in Zeeland. Hours of fun with a bowl and some stones. Driving over the first section of the DeltaWorks dam. 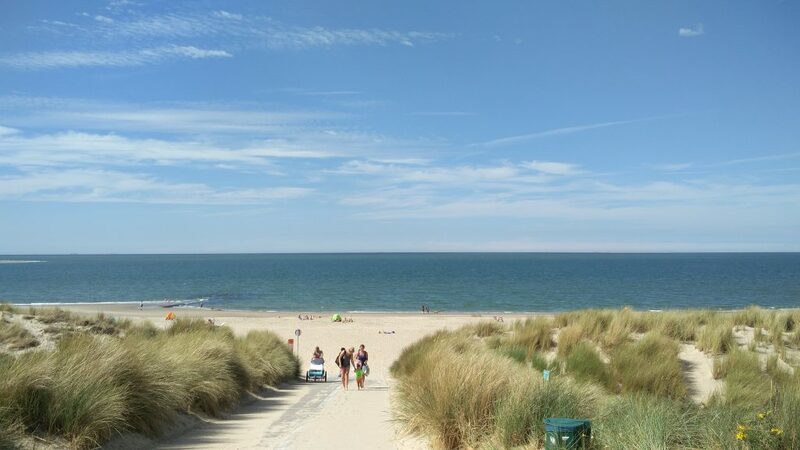 Miles of sandy beaches and dunes. Shame about the jellyfish, we didn’t want to swim! This will be the first of our actual travel posts…i’m fully expecting these to get less a) frequent and b) verbose as we go so I’ll apologise now. 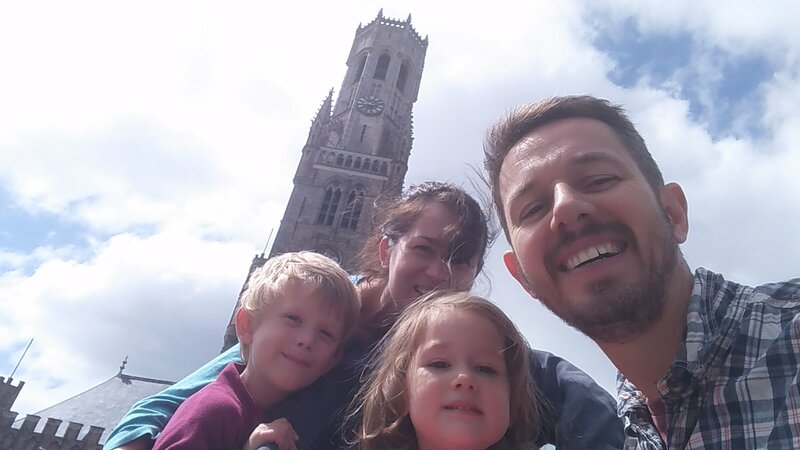 On Sunday we left France and headed north into Belgium, we hadn’t booked anything as we’d seen there was a town style camperstop in Bruges and figured we’d give it a go. A swift hour or so on the road and we were there and into the camperstop. It was basically a carpark with big spaces, a few taps, and a drain for the loos..BUT…10 mins walk and you’re in the middle of Bruges for 25 EUR a night. Perfect. – Waffles and or chocolates…say no more. 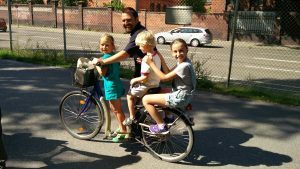 – Bike lanes…why are we so crap at this in the UK? 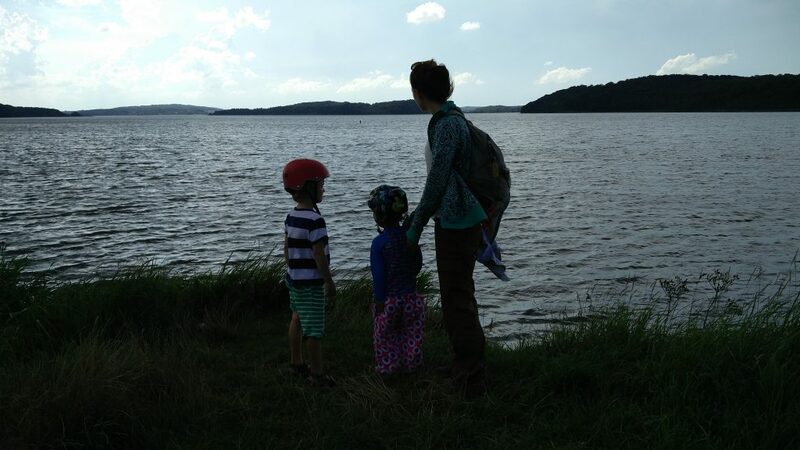 – All four of us riding round the river path and finding all manner of bridges and windmills. We screwed up our departure time on the Monday (enjoying our ride too much) and ended up staying the whole afternoon. Rather than staying over night, which we maybe should have done, we thought we’d forge ahead to Holland. It turned out to be a bit fun, which is one for the next post. Can you see Colin Farrell at the top? We MAY have had some of these…MAY! Feels like we’re cheating having windmills before Holland! The Swedes next to us were very happy to be next to a fellow Burstner. Here you can see the size of the spaces. Just before we left we had people both sides and it was tight. 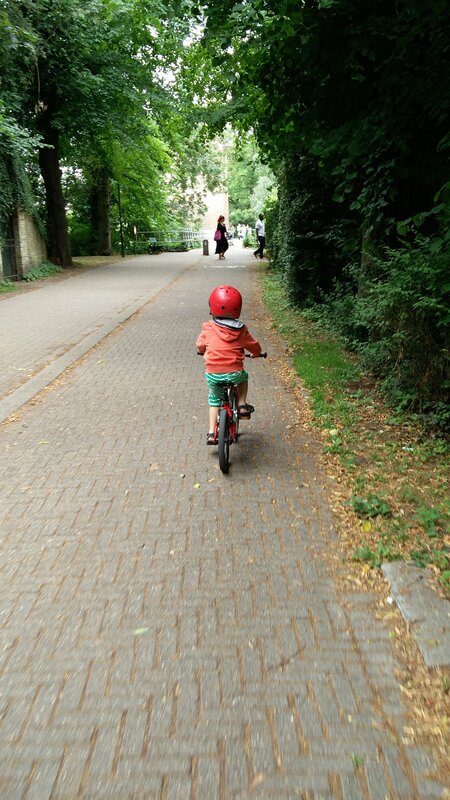 And he’s off…Aidan loved the cycle lanes….a lot. Lounging on one of the banks near Minnewater park….Bruges seemed to be full of people just chilling out…I want to be one of them. Yet another crazy couple of days. Thursday was leaving London with packing the van up (and emptying that toilet) and finally finishing the last of the house sprucing. I also had to pilot the van onto our street which wasn’t anywhere as bad as I thought. New house meets old house. 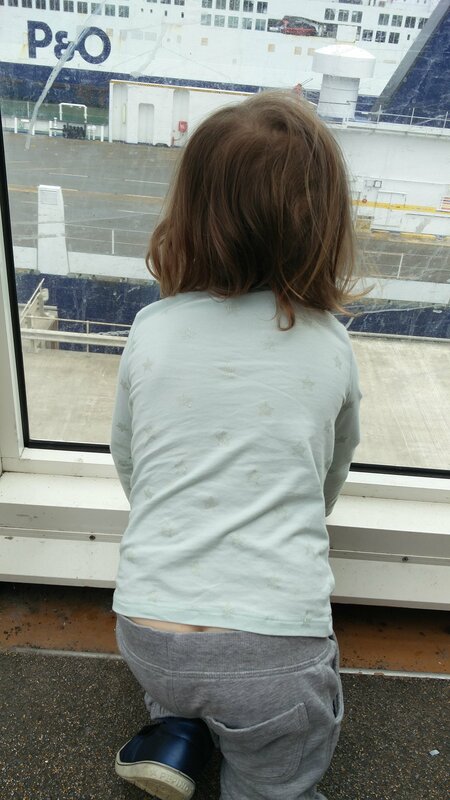 Friday was actually leaving the UK, the big day we’d been building up to for months. We got up and packed the final washing and stuff into the van. Including a lovely new fold up table…thanks K&L! 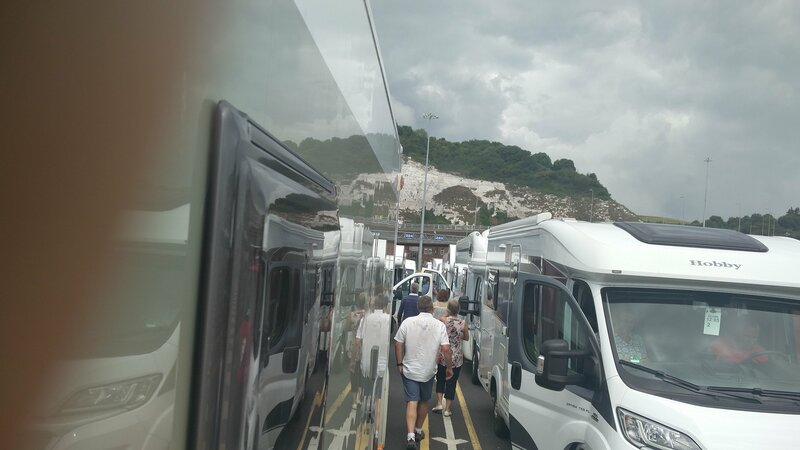 Then we were off Dover bound. 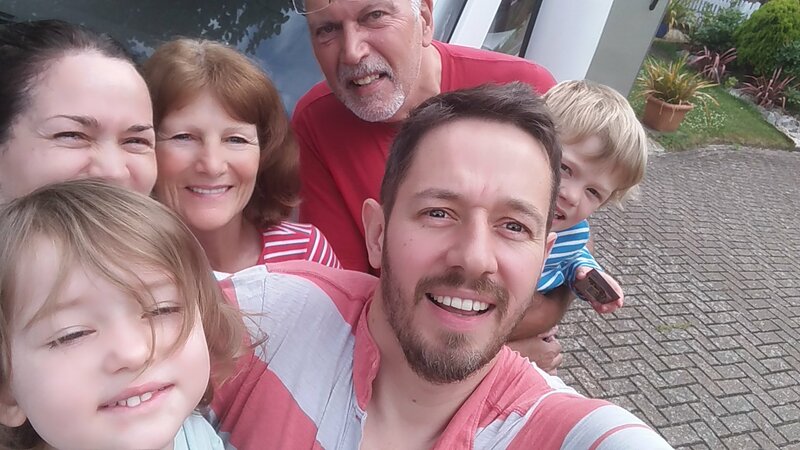 The one with all our faces…but us all looking a bit confused!. 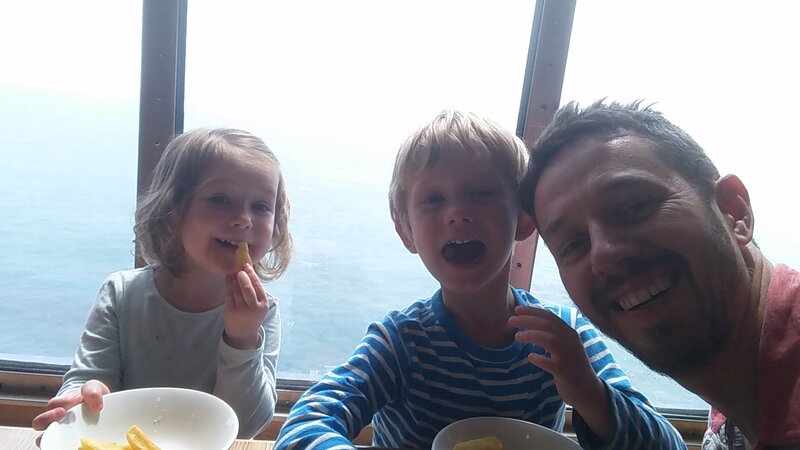 Predictably the kids loved the ferry and all the driving on and off and in and out. There were some sights but all was good. We got off the other side and I remembered to “DRIVE ON THE RIGHT”…so all good! Waiting for immigration, having a kitchen for sarnies right there is awesome. To hell with the slow lane….i’m in the camper lane. 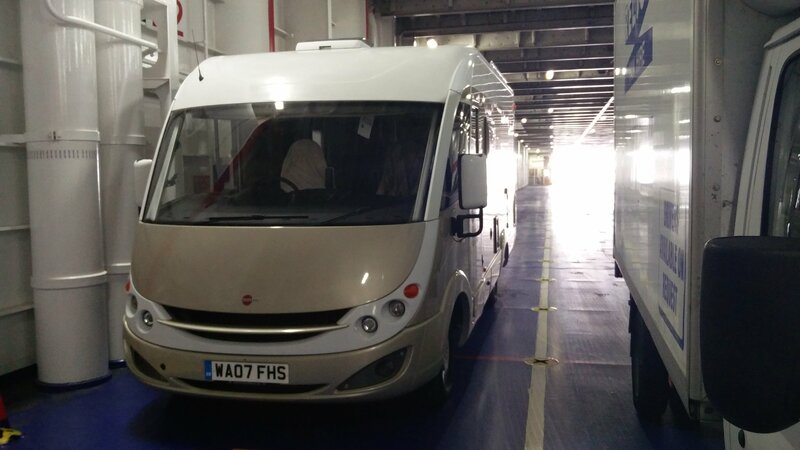 Our van in the belly of the ferry. Maybe the best P&O advert in the world. Now we’re about to turn in on a lovely campsite and our first continental stop at Château du Gandspette. 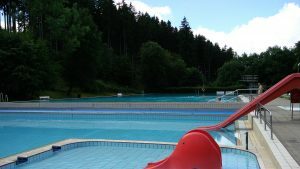 Everything you’d want in a french campsite, swimming pools, playground, table tennis, and a cafe serving frites! 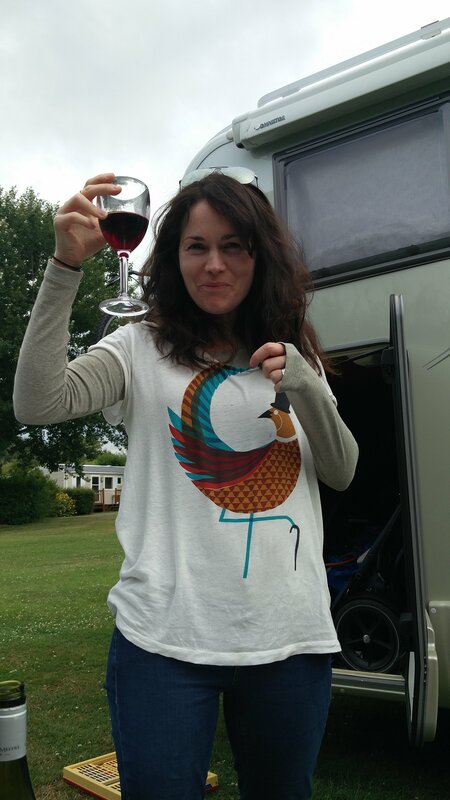 So on our rather long winded “Grand Depart” we’ve finally departed….eep! Lets be frank. 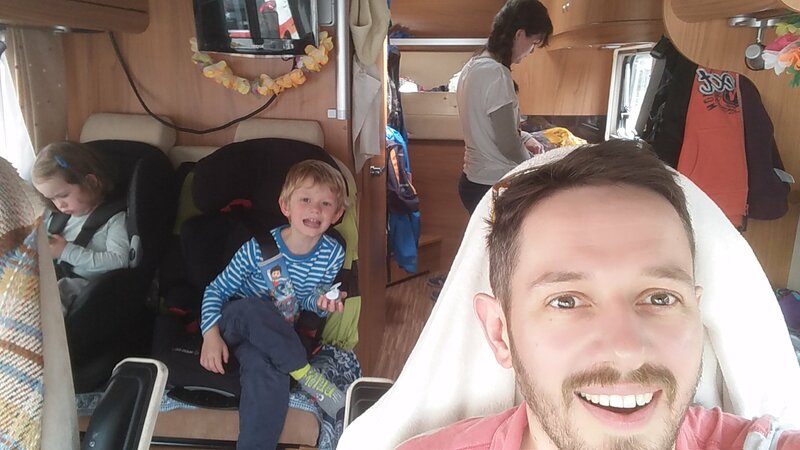 Most of these motorhome things are built, not for families, but for people who’s kids have flown the nest and finally have freedom to use them. This means things like, falling out of bed aren’t usually considered as the target customer has a good bit of experience NOT falling out of bed. My kids on the other hand…could well fall out of bed! 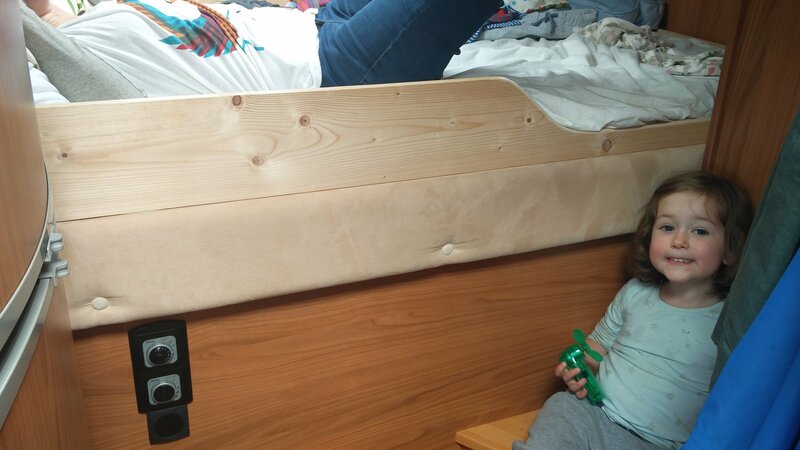 Aidan and Anna use the bed at the back of the van and there’s a gap of about a metre and a bit without anything to stop them falling out. We’ve been propping the ladder from our bed up there so far but it’s a bit annoying and we were hoping to leave it behind as it’s big an heavy. Cue, Matt and his amateur woodwork!